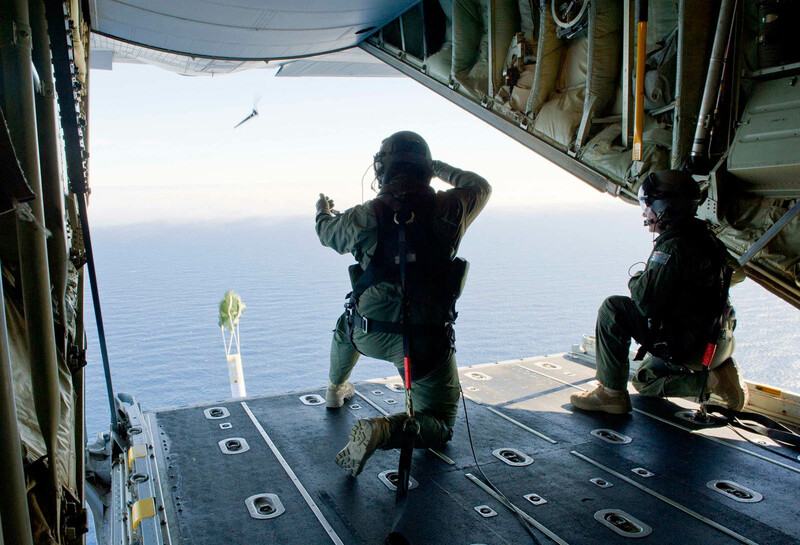 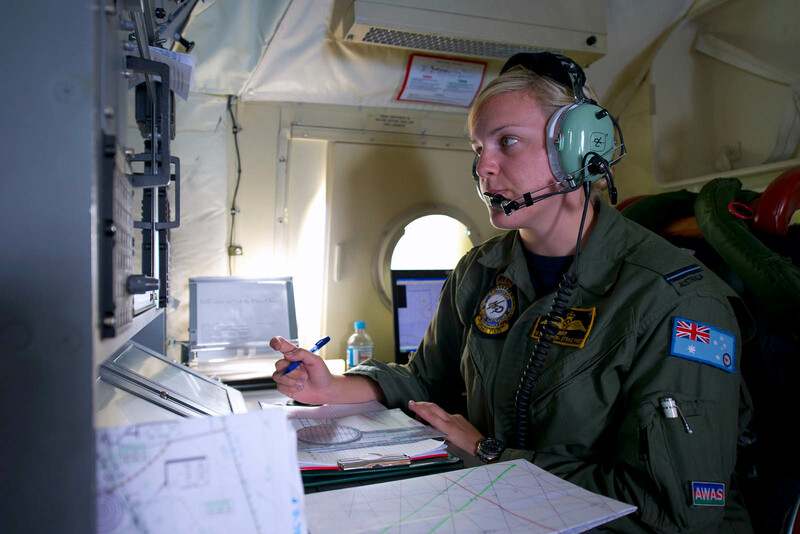 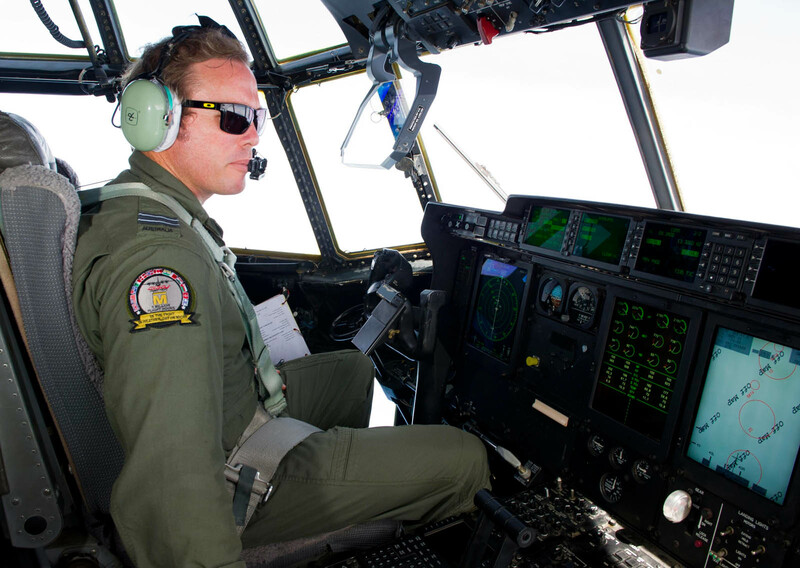 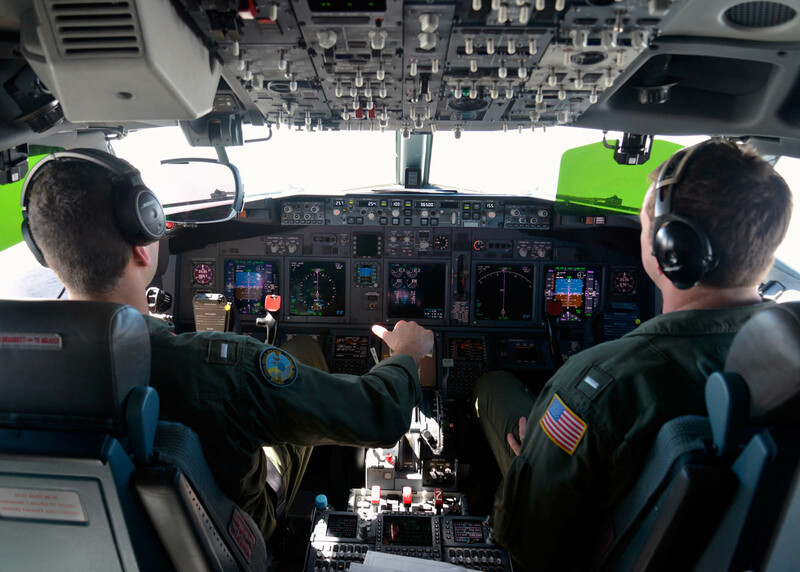 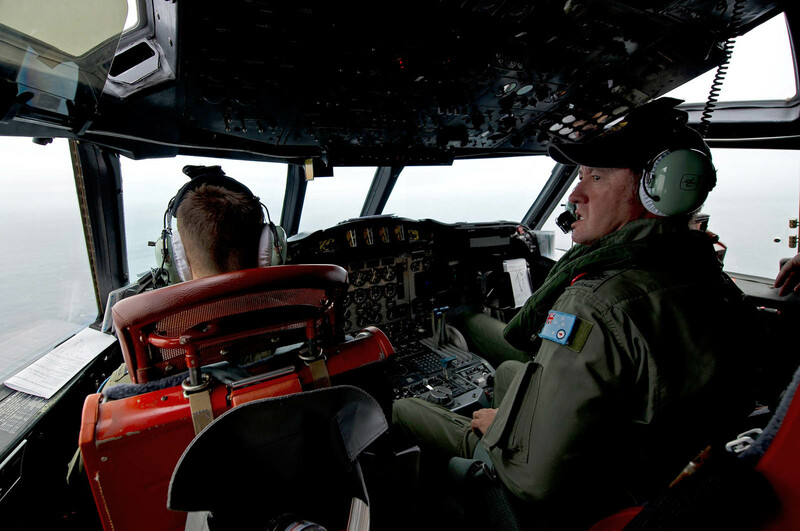 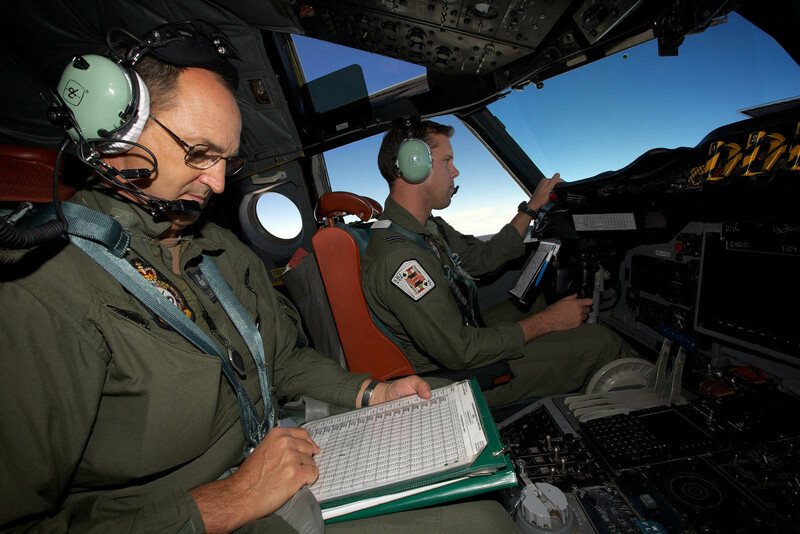 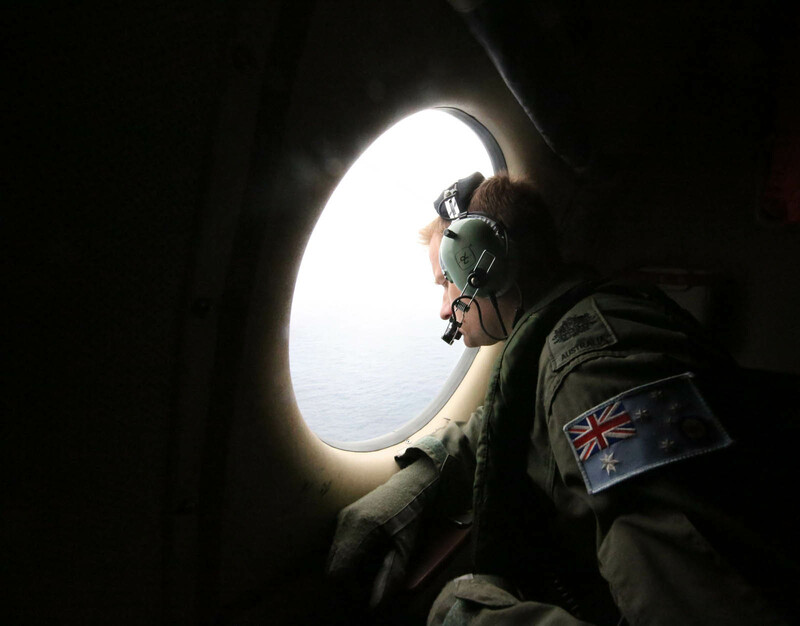 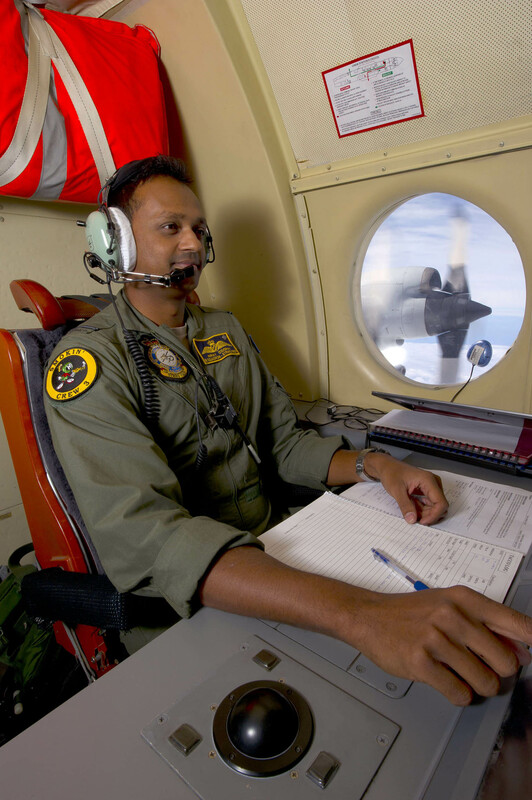 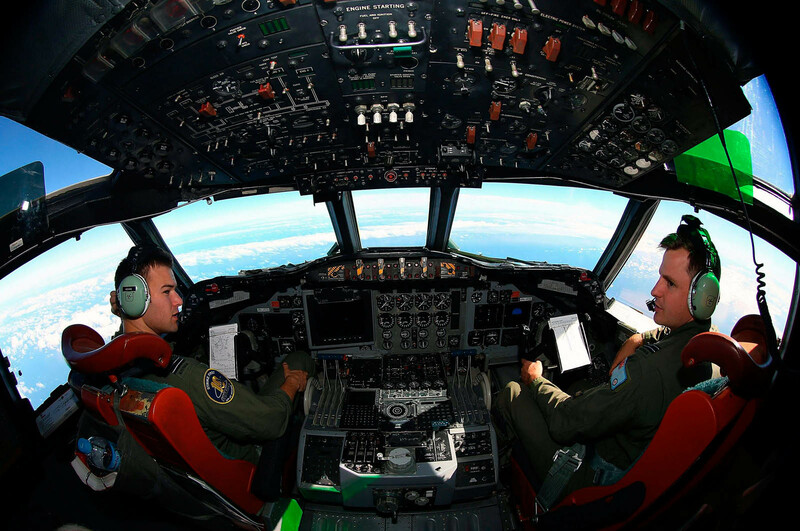 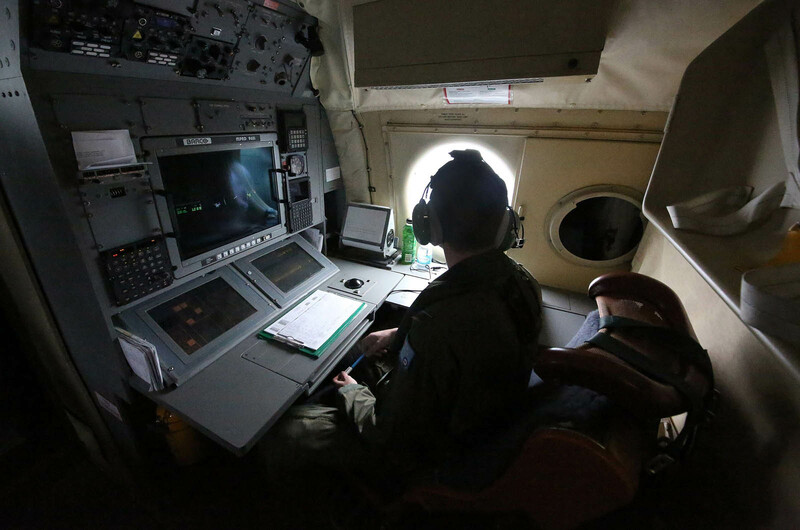 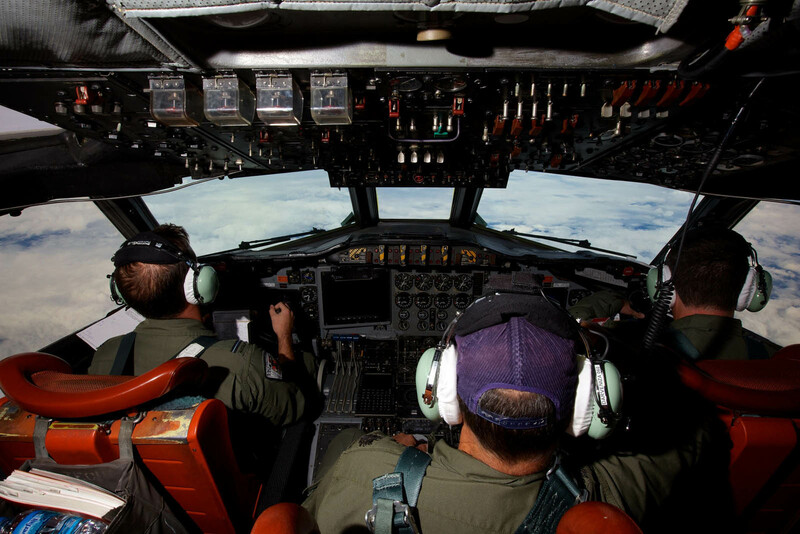 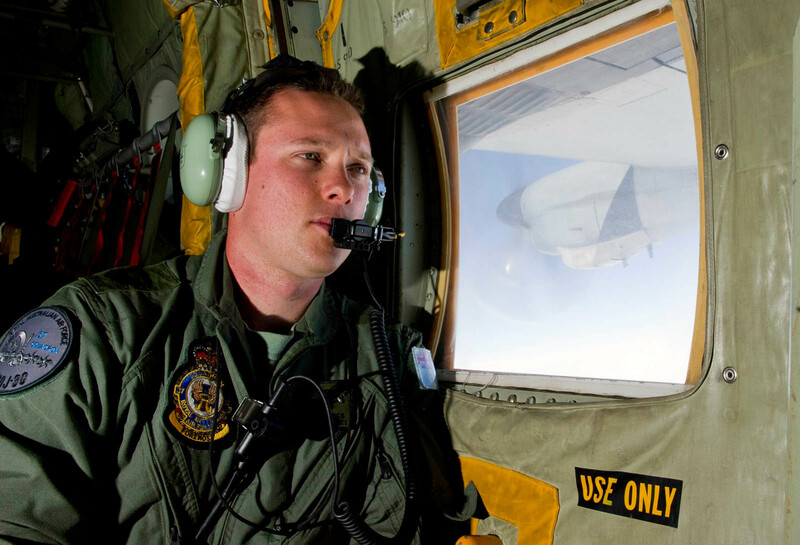 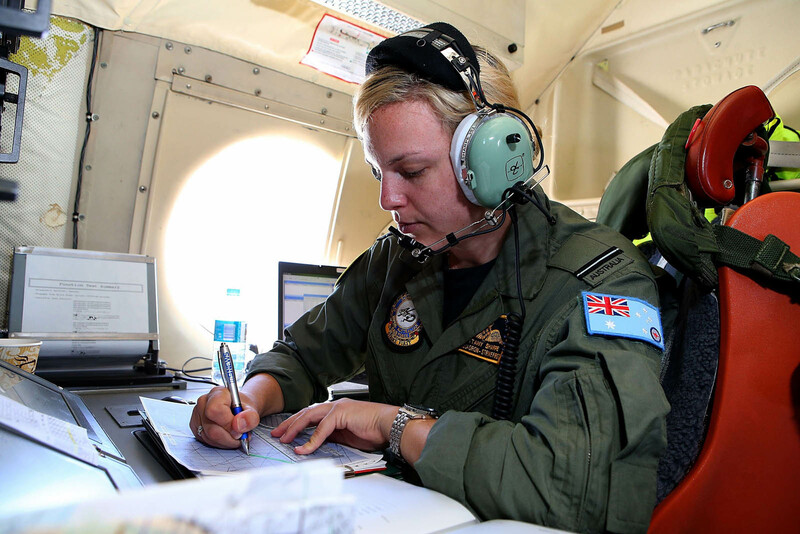 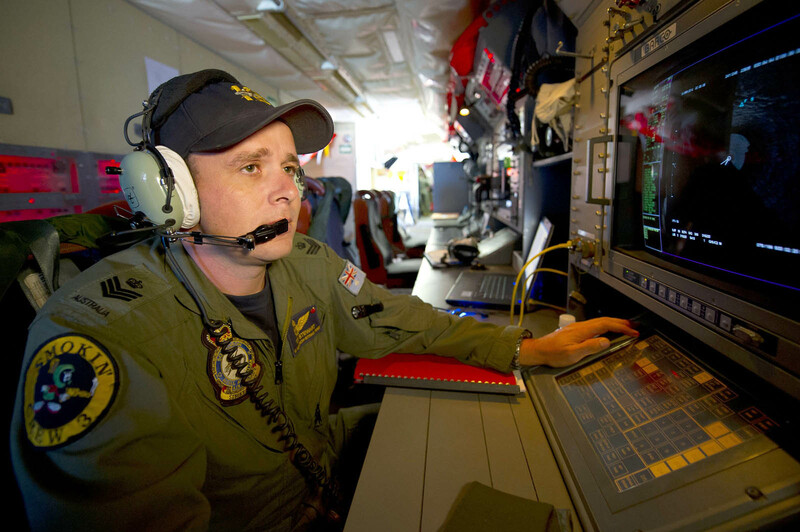 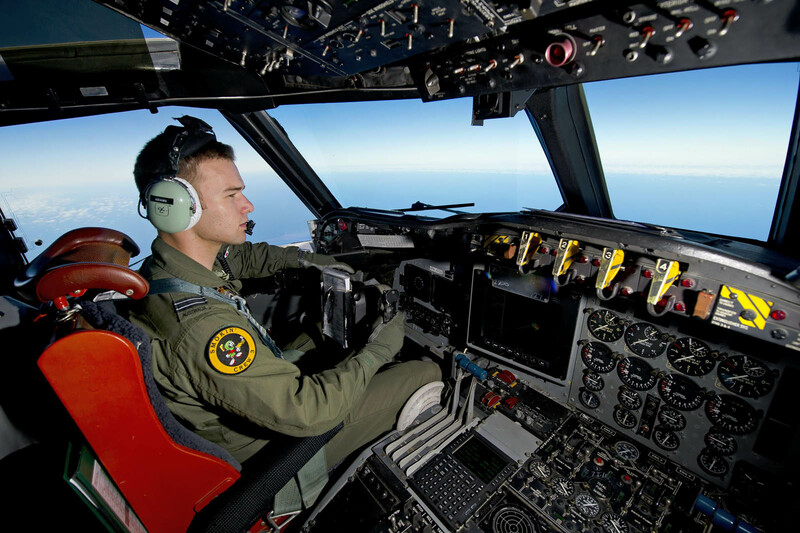 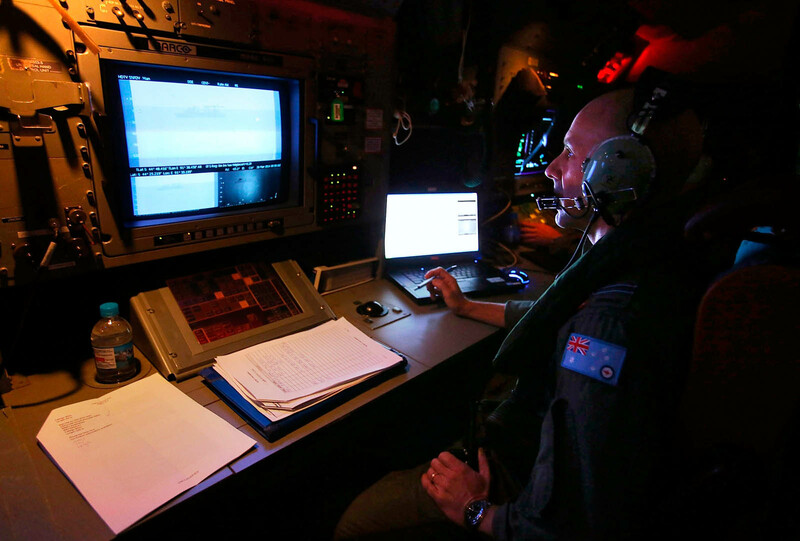 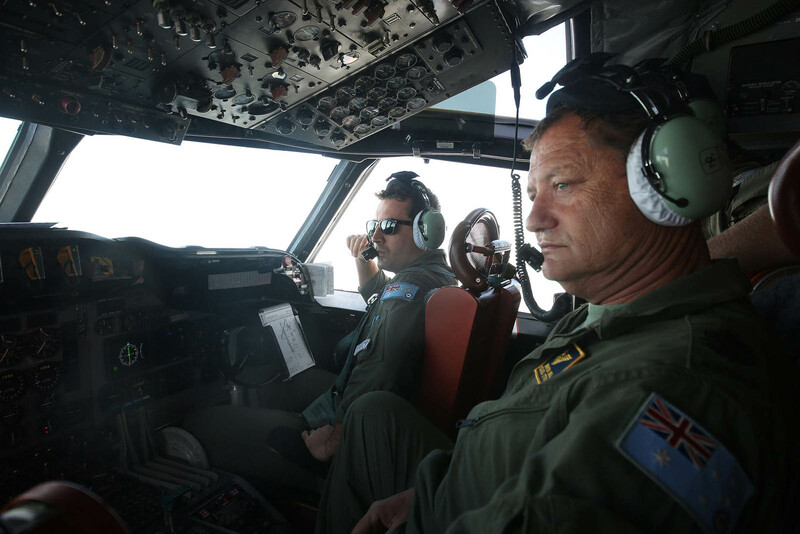 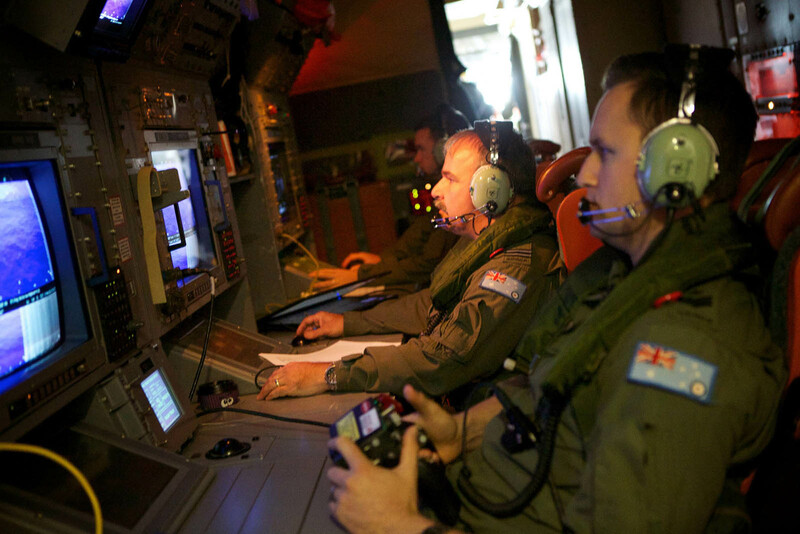 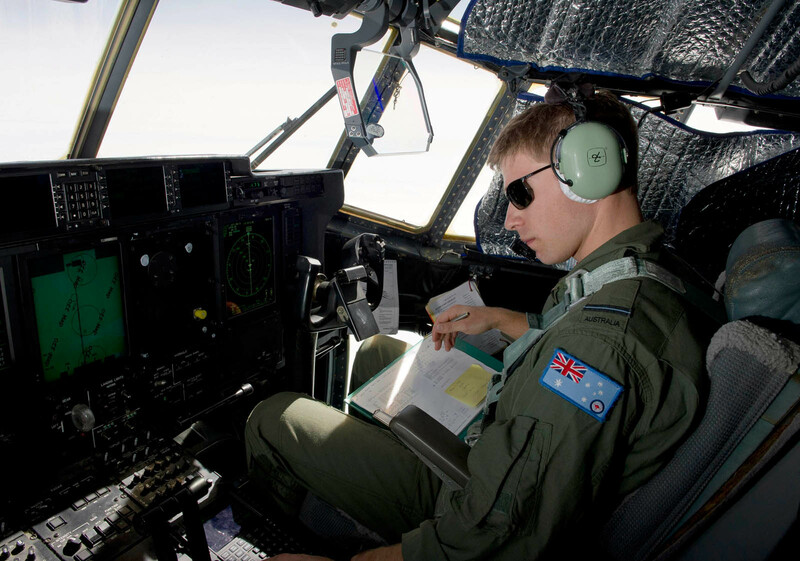 A Royal Australian Air Force pilot flying over the Southern Indian Ocean during the search for missing Malaysian Airlines flight MH370. 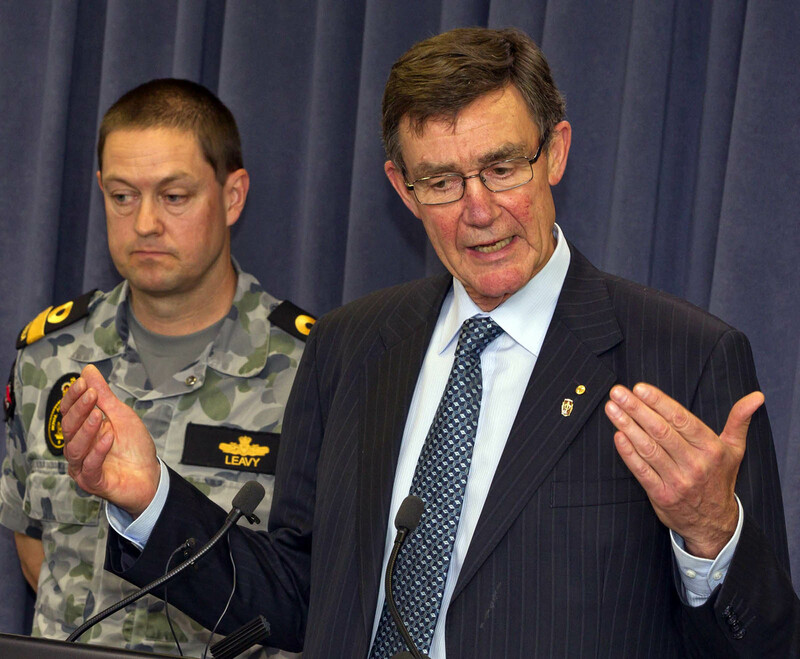 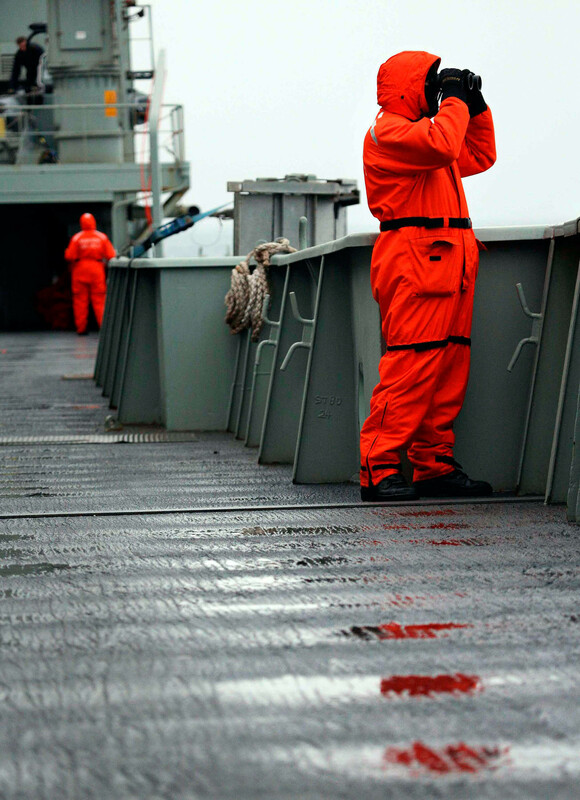 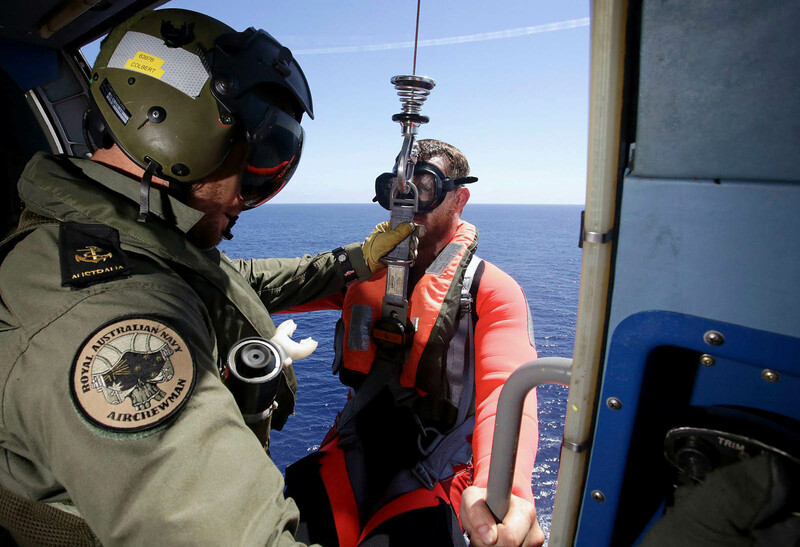 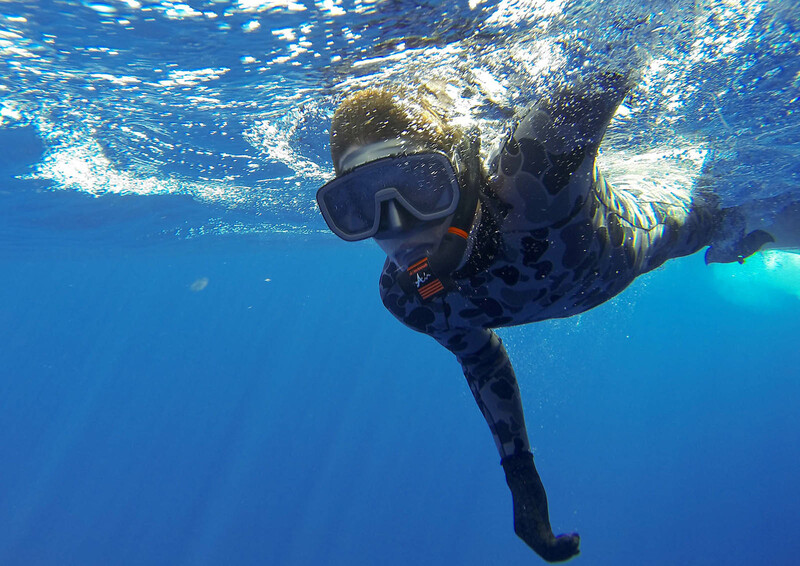 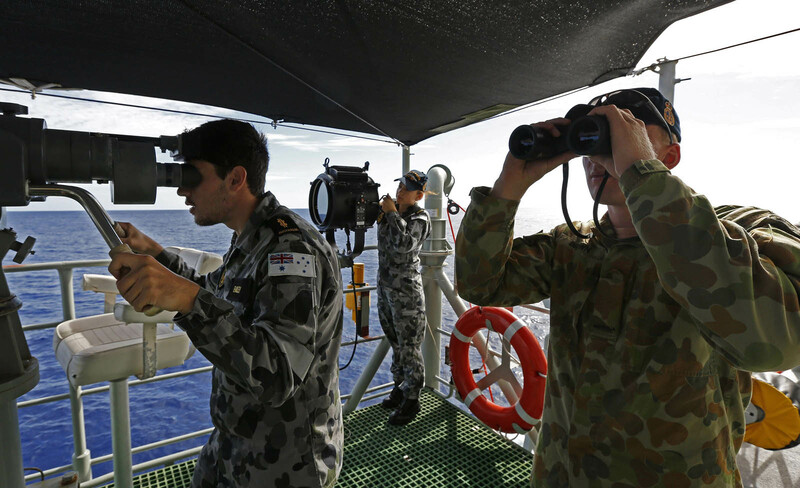 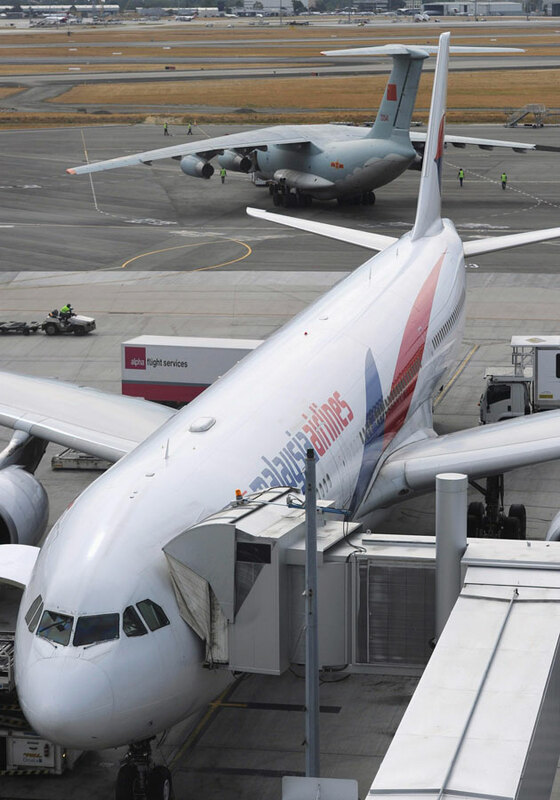 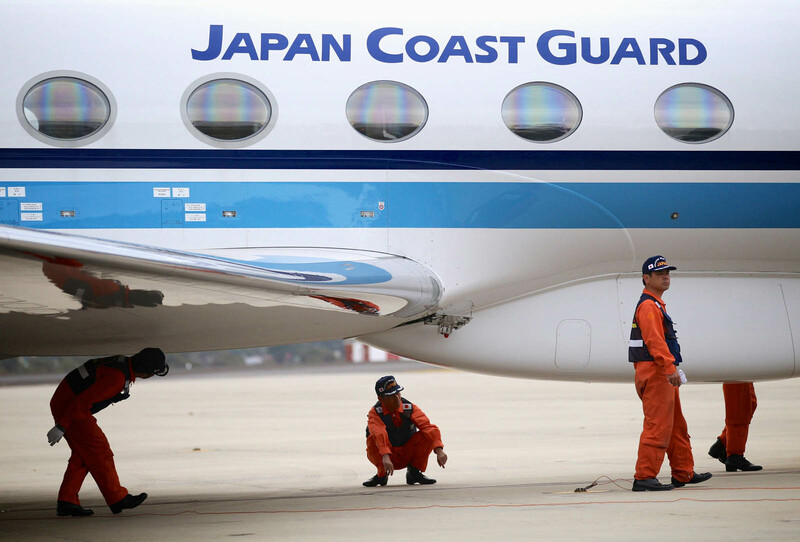 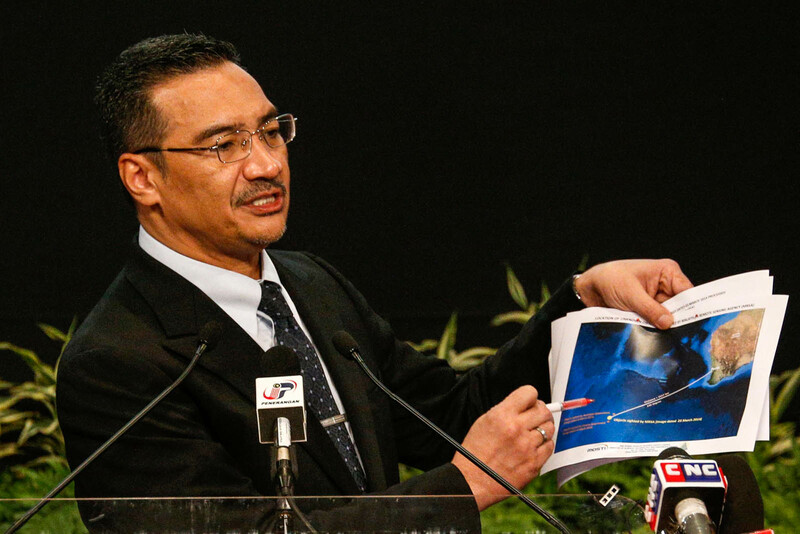 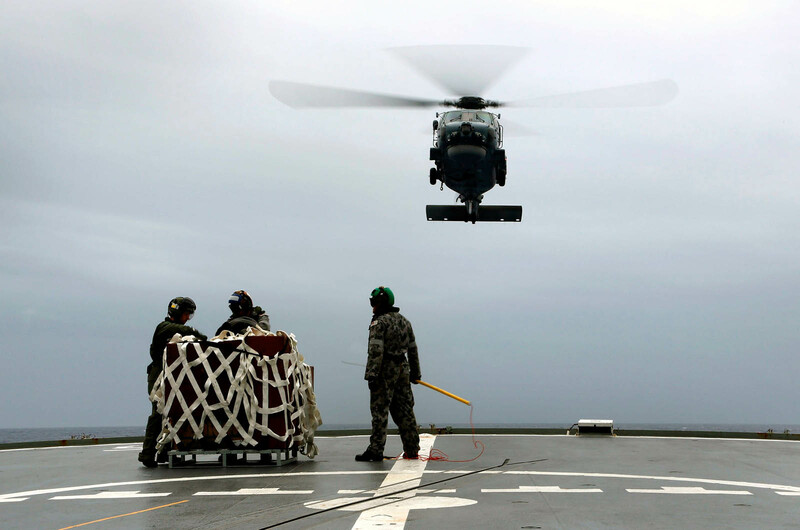 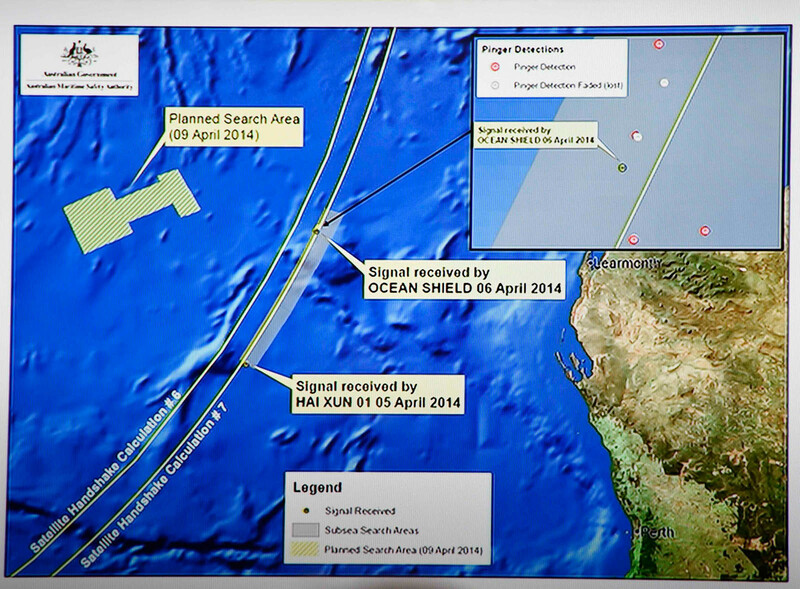 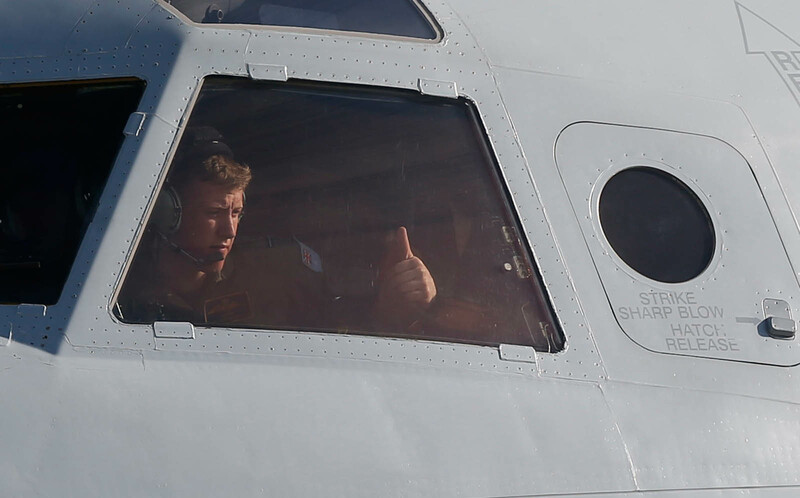 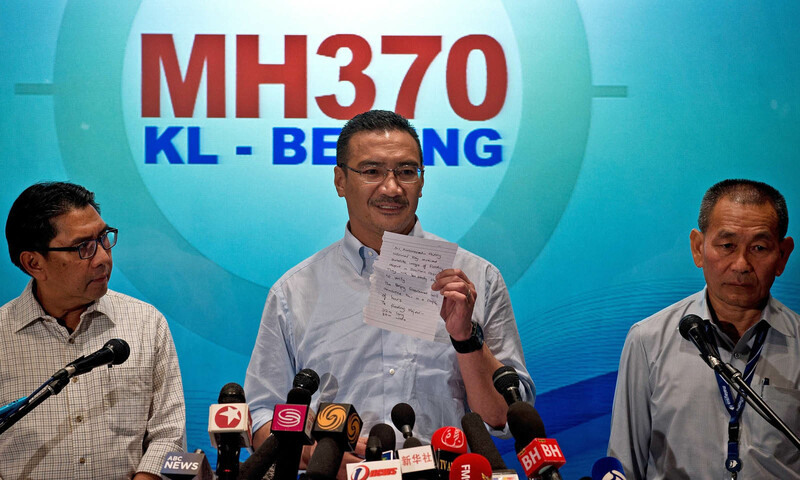 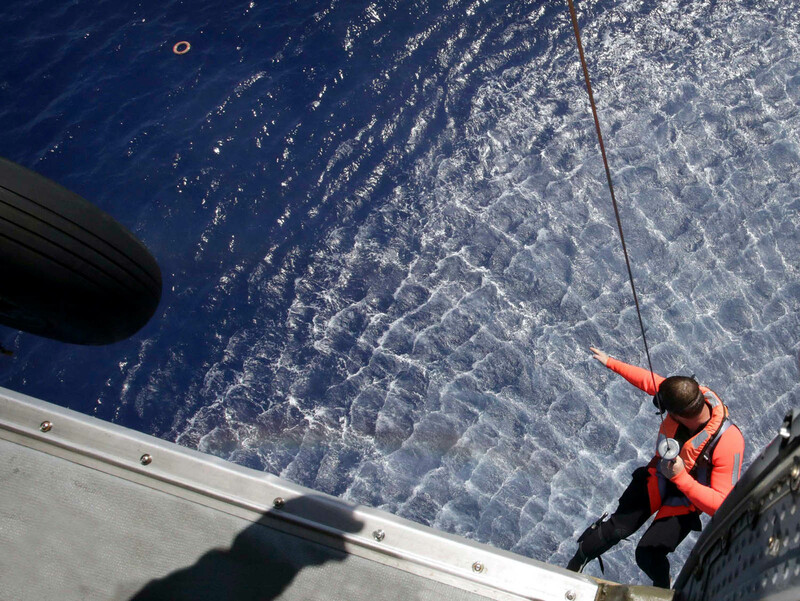 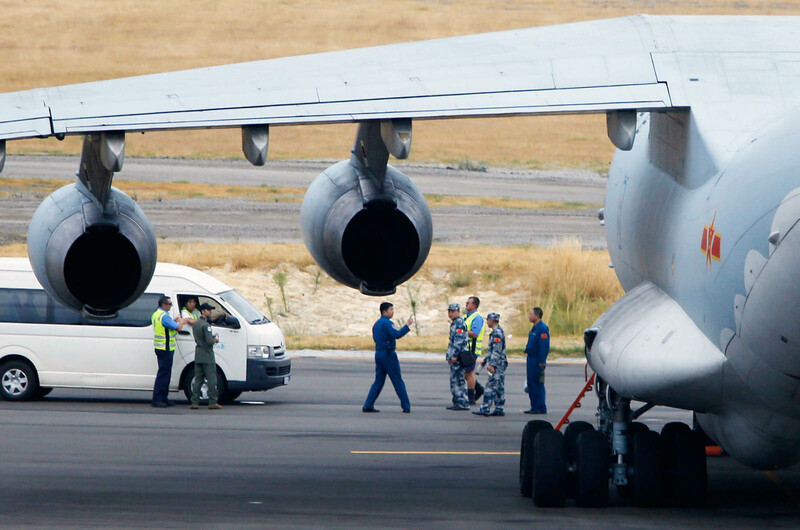 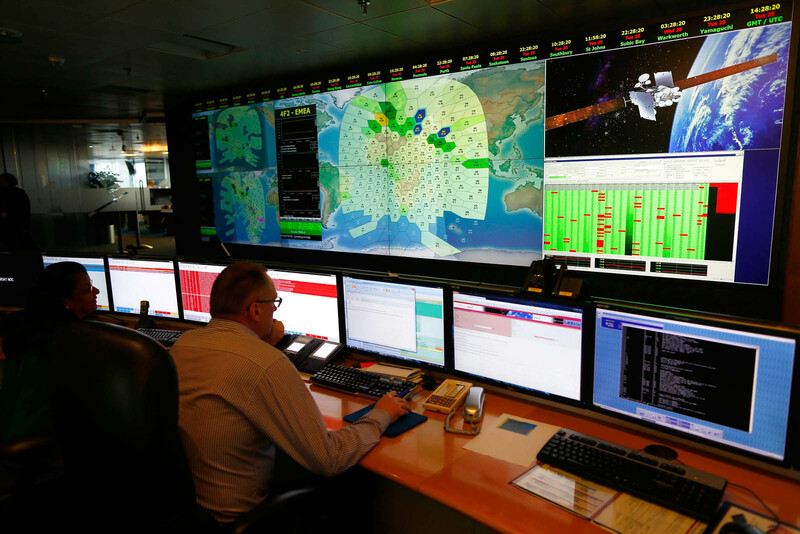 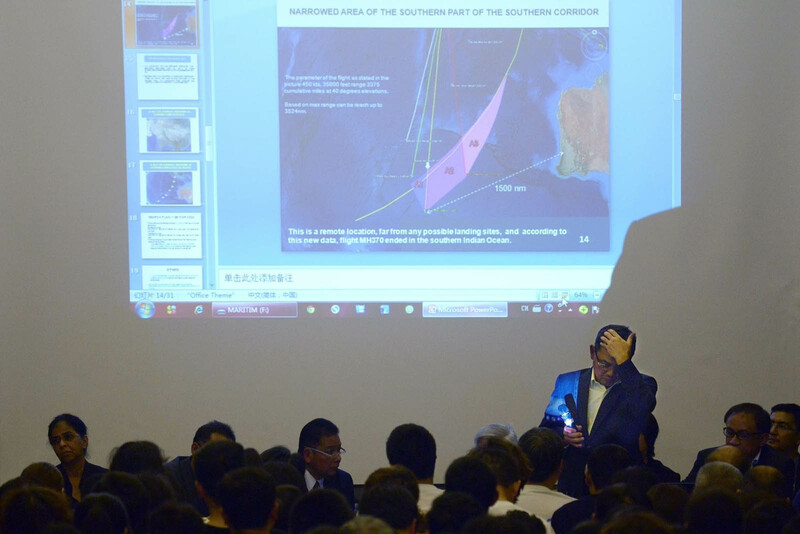 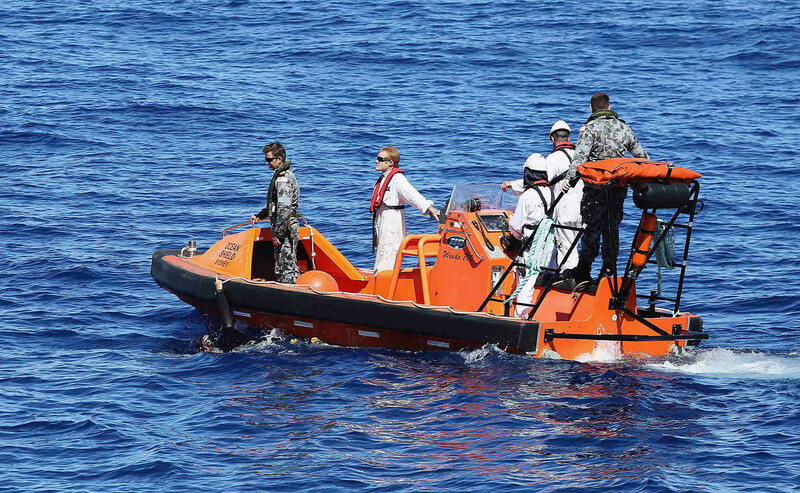 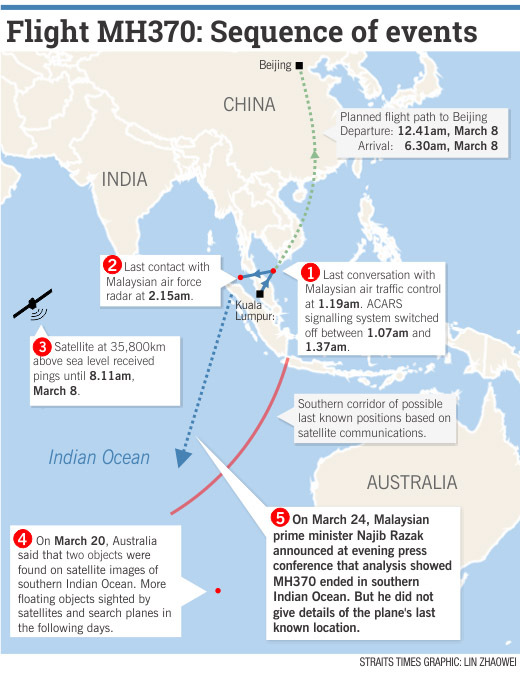 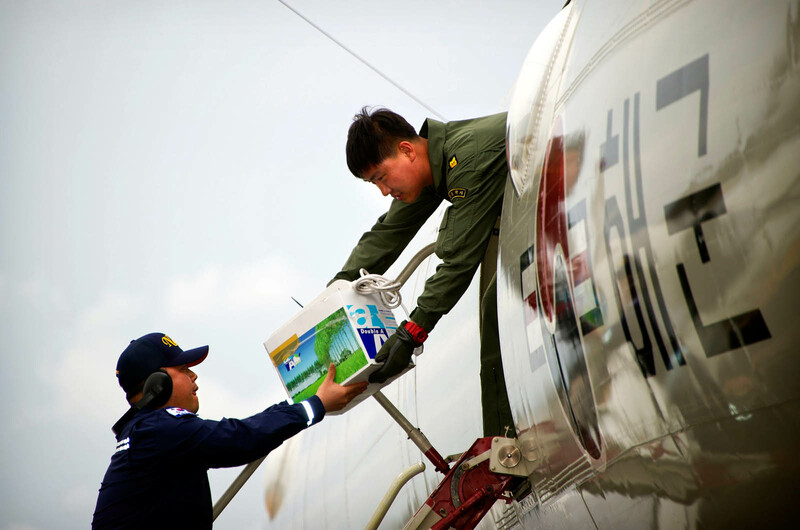 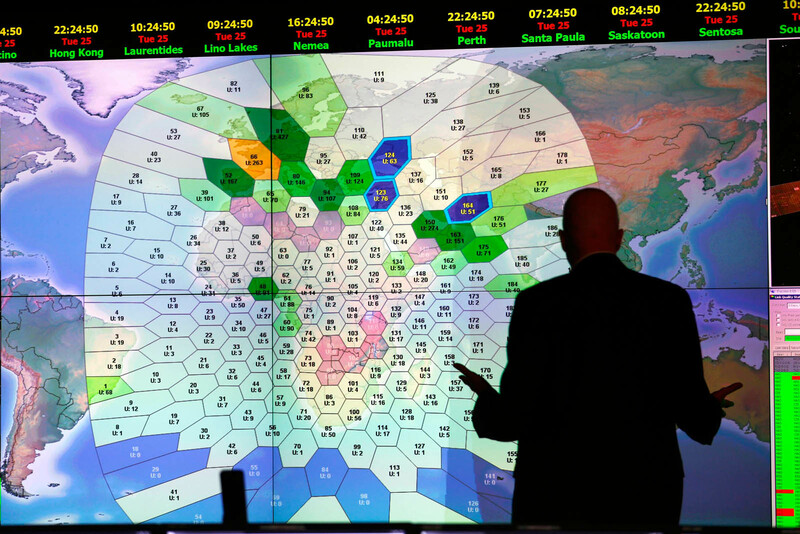 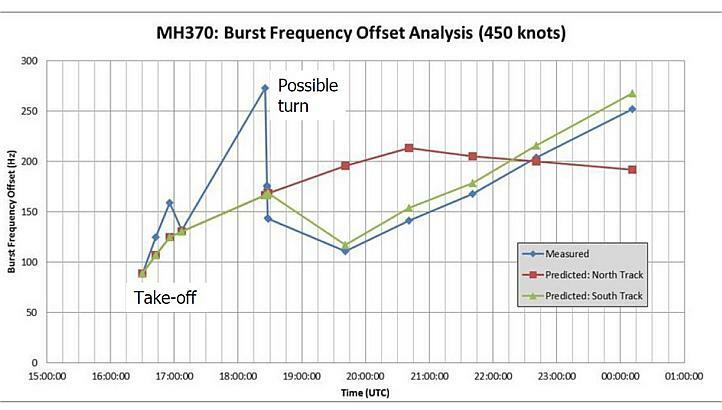 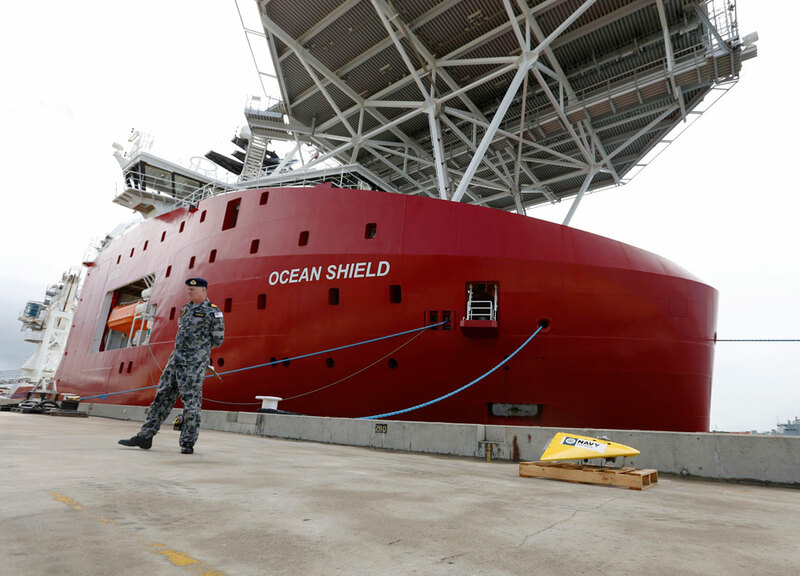 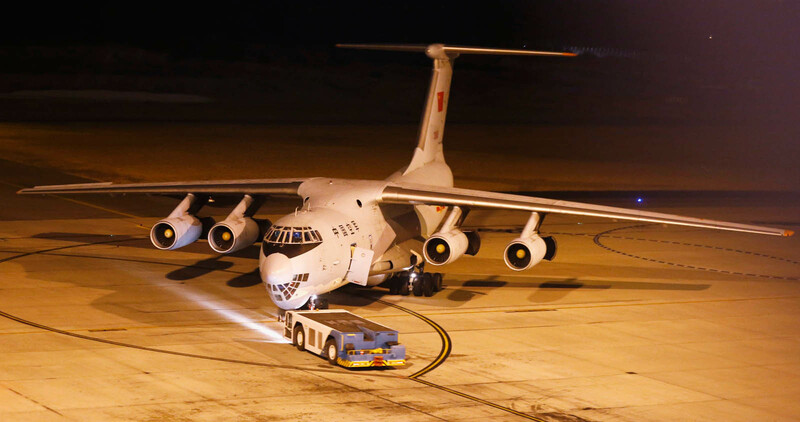 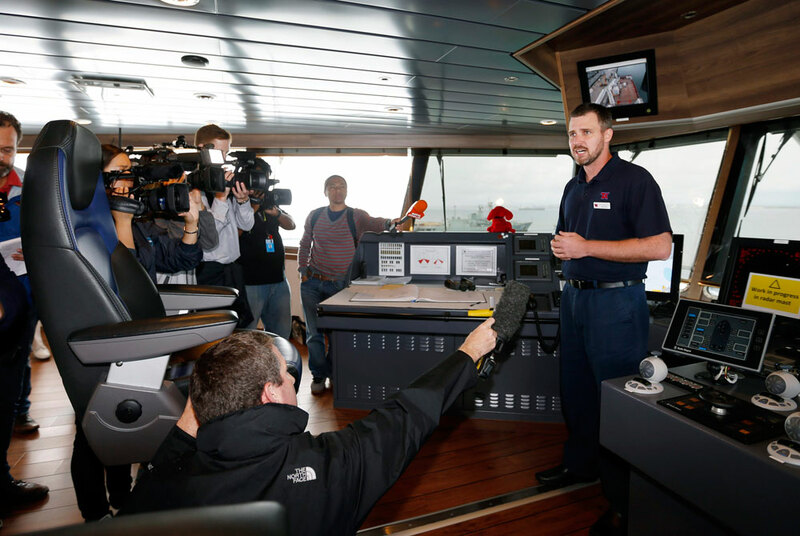 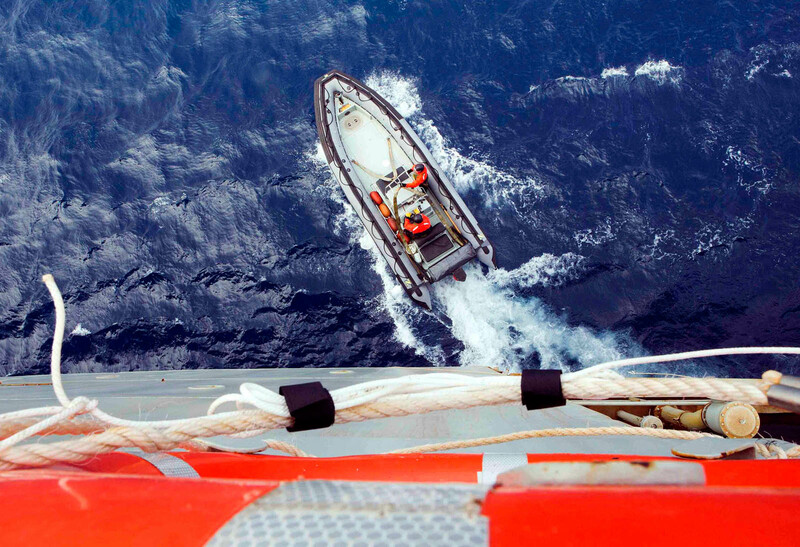 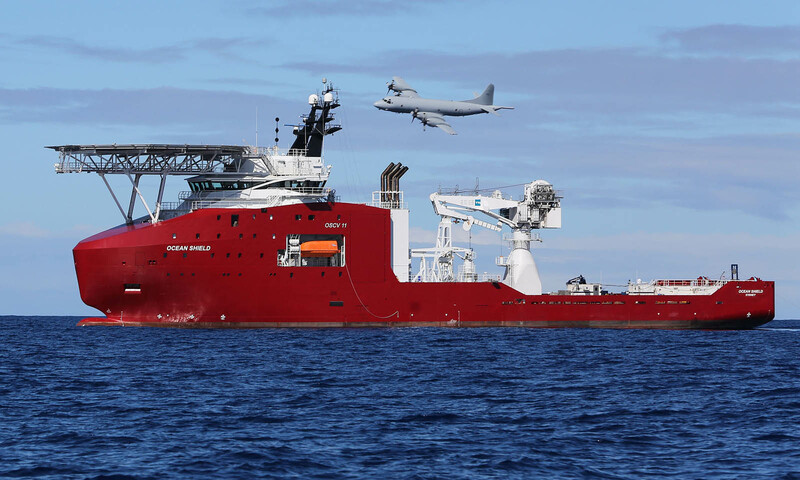 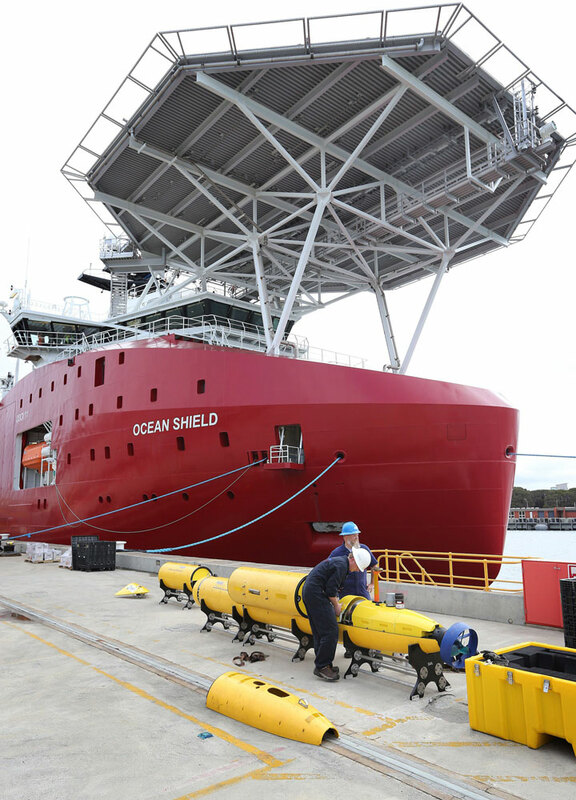 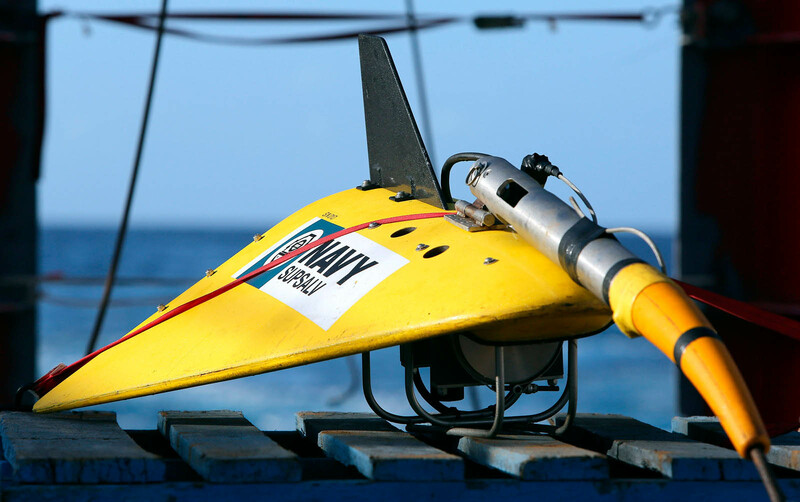 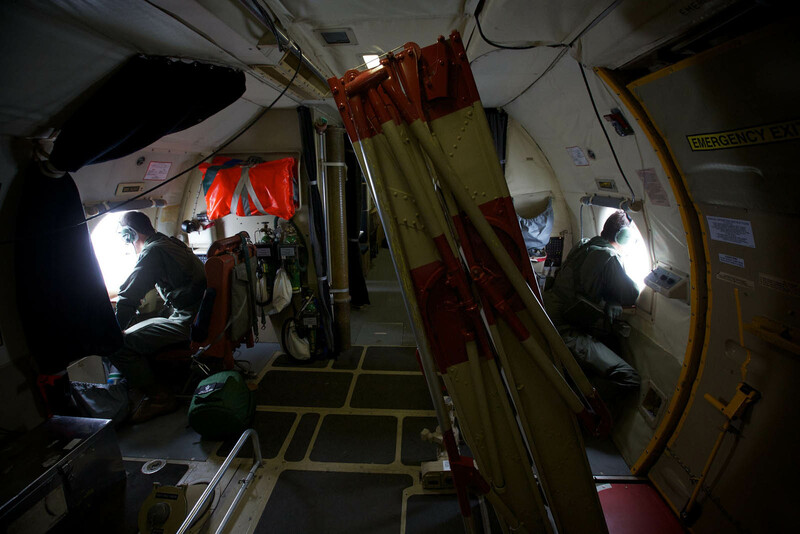 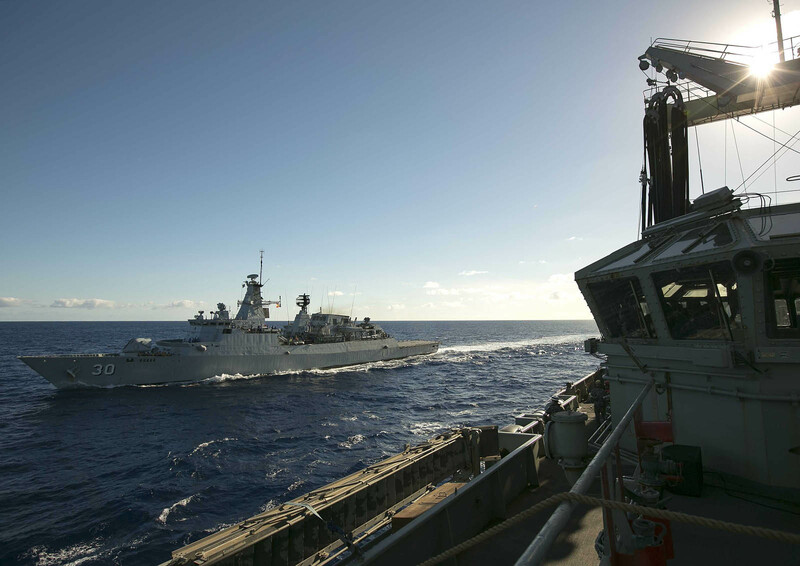 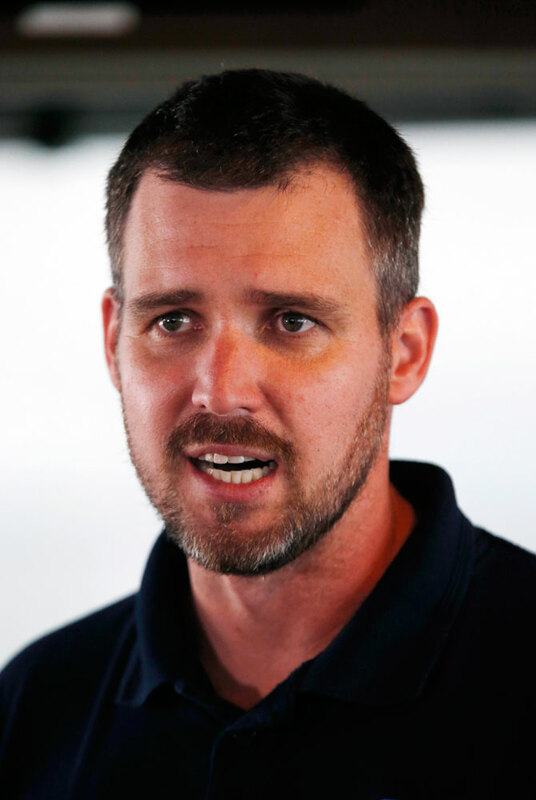 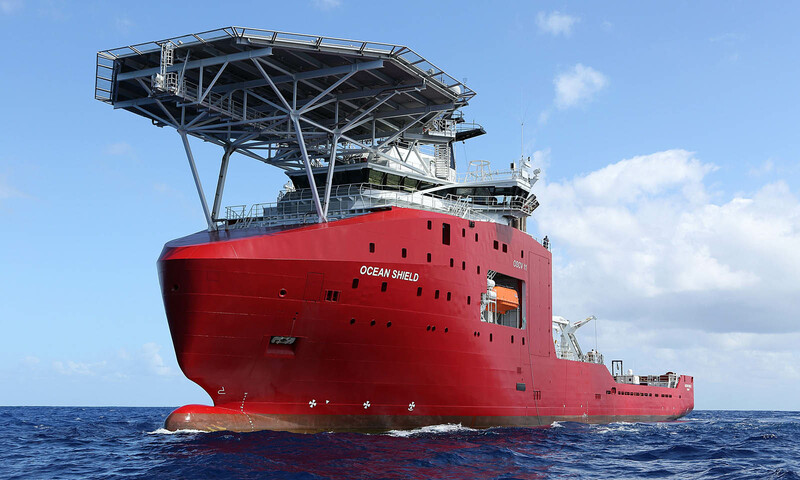 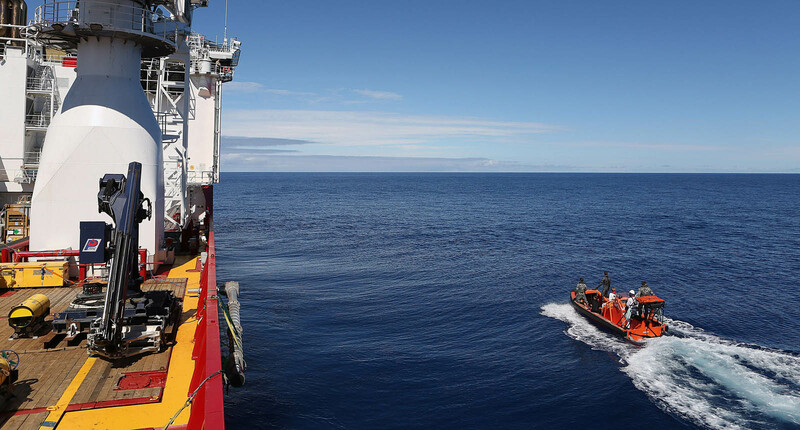 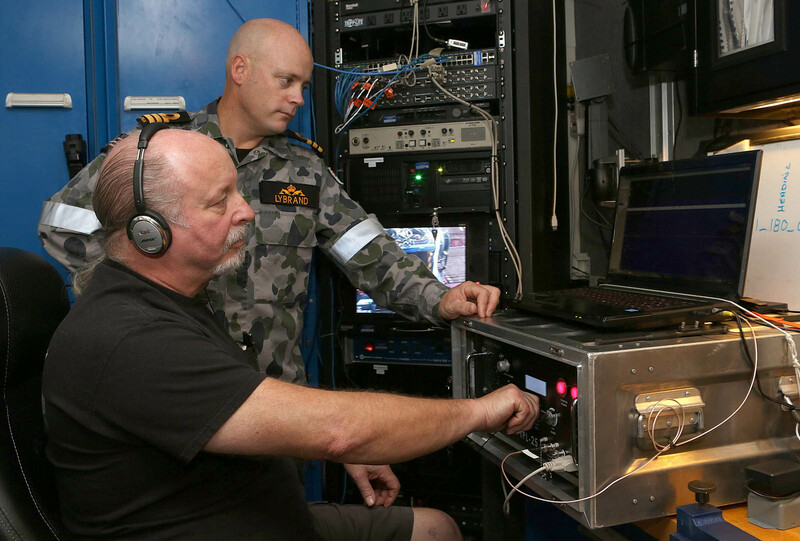 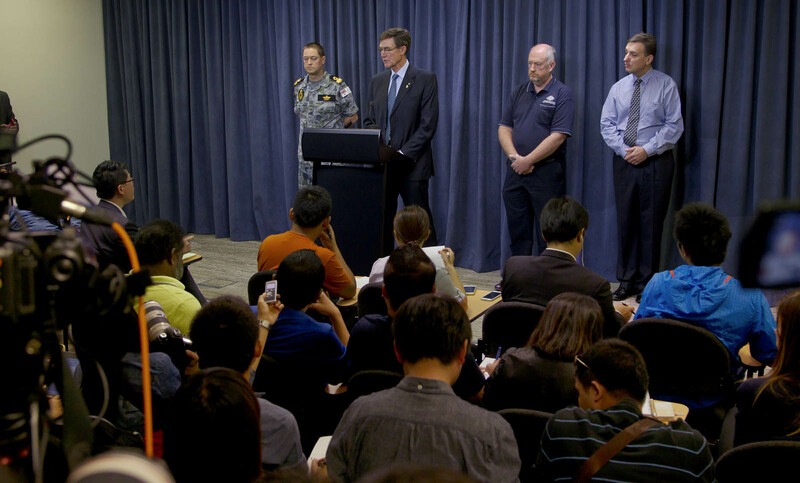 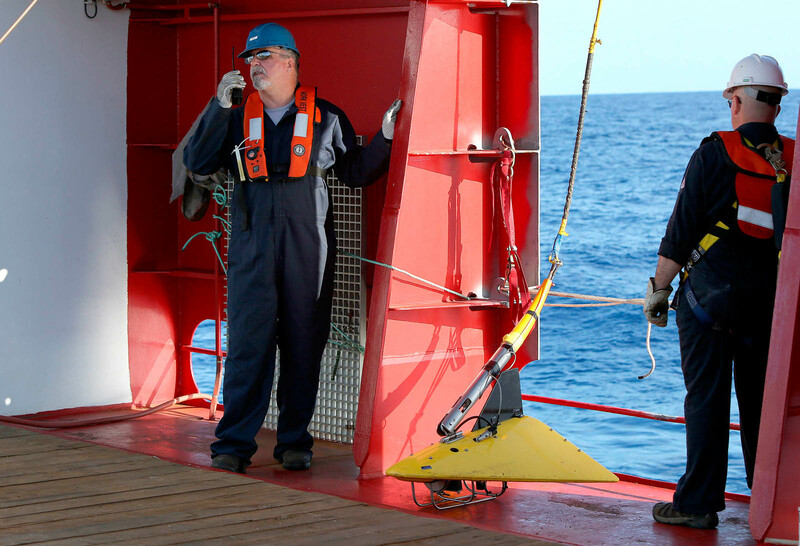 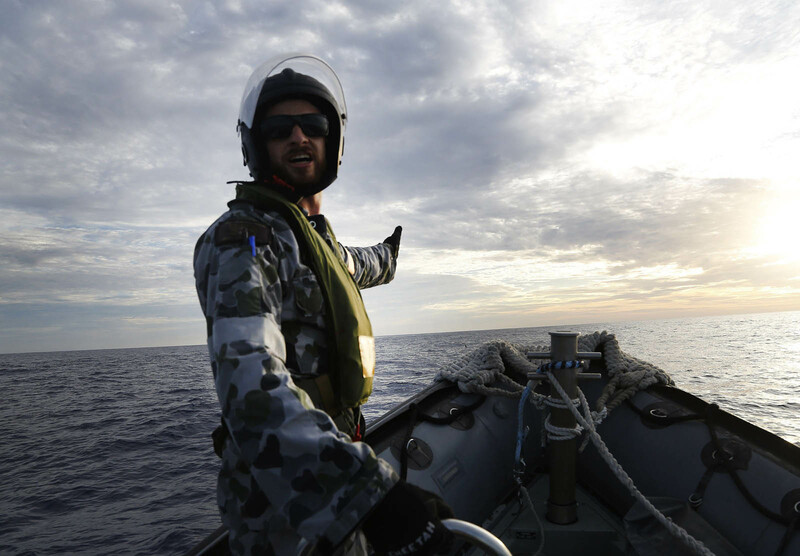 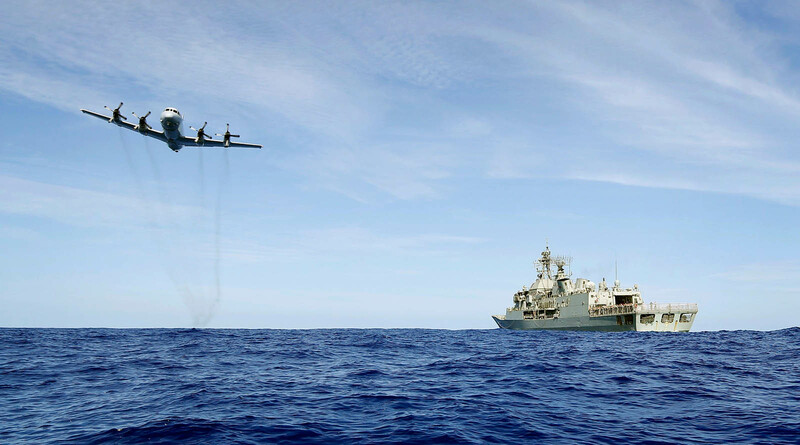 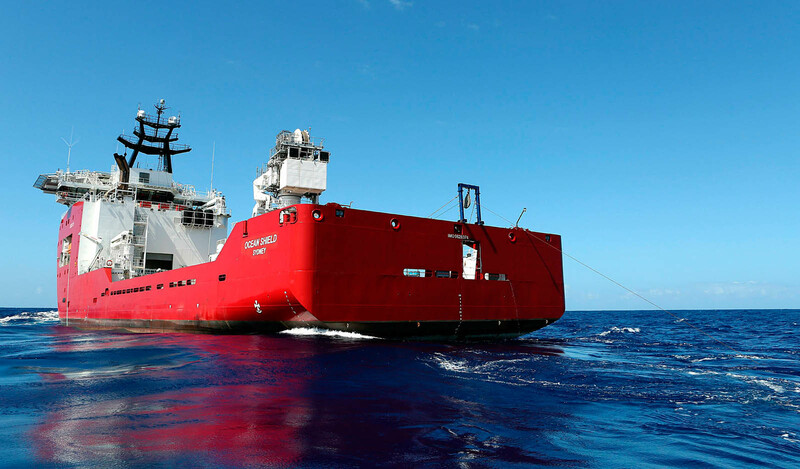 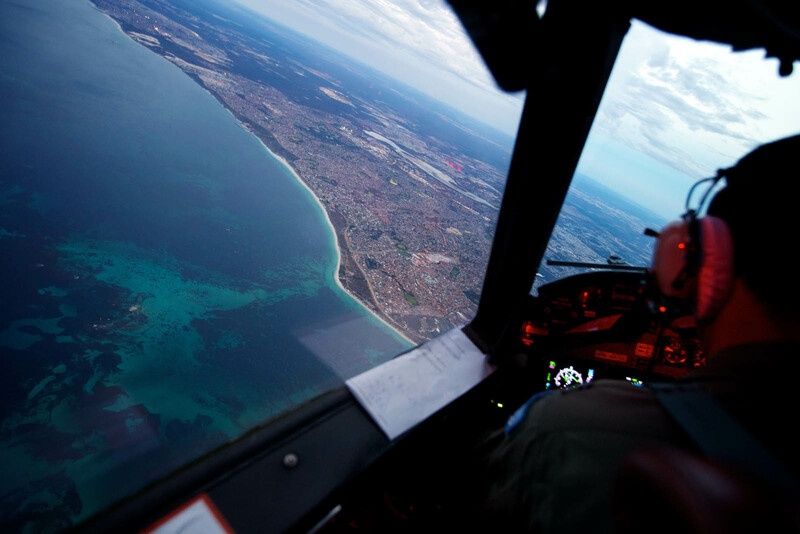 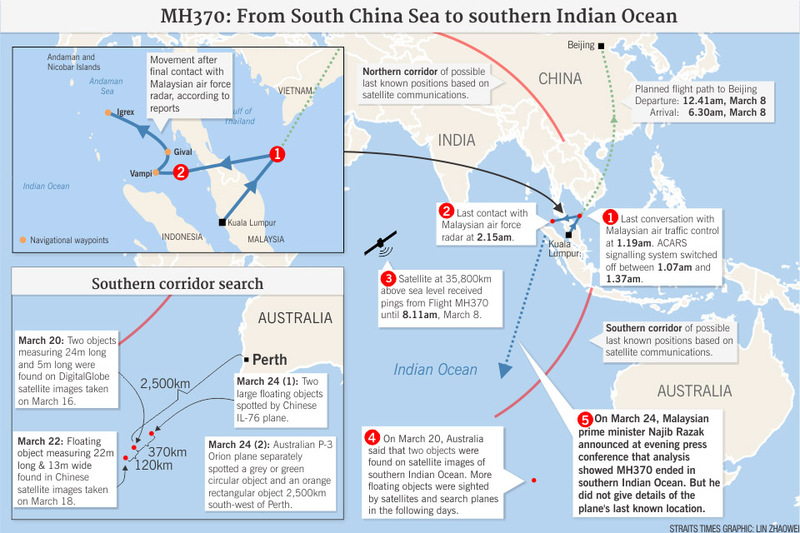 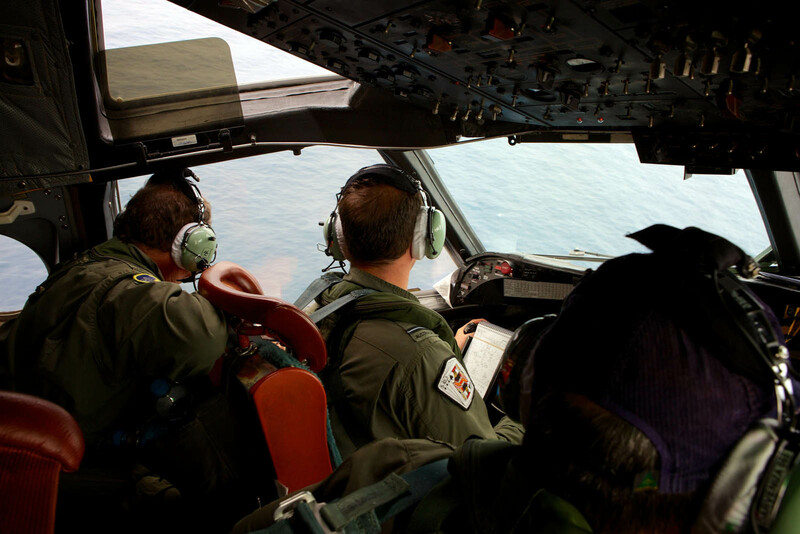 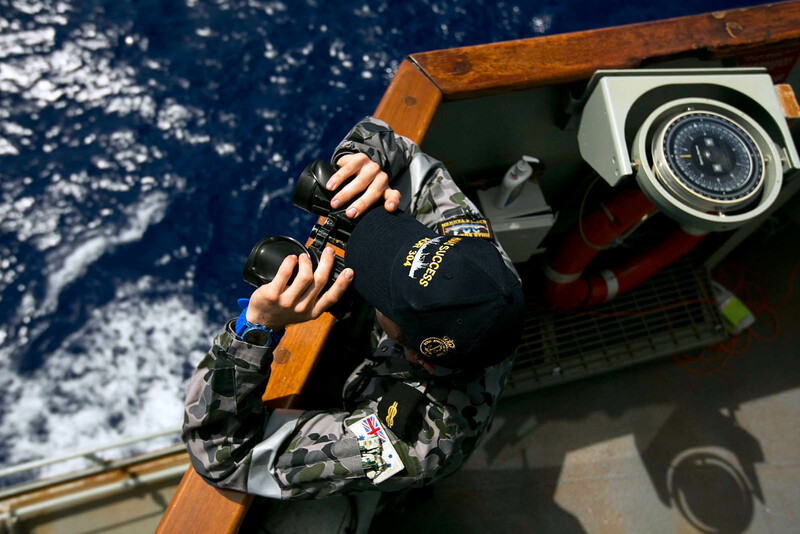 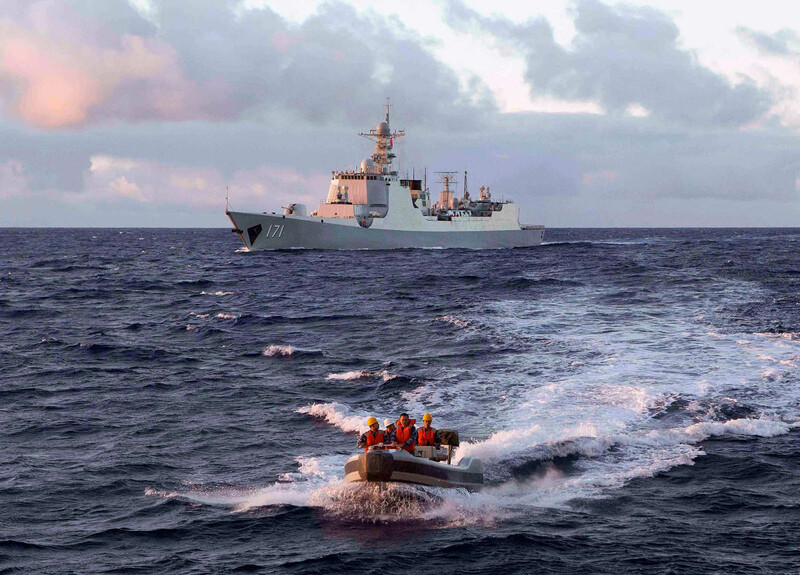 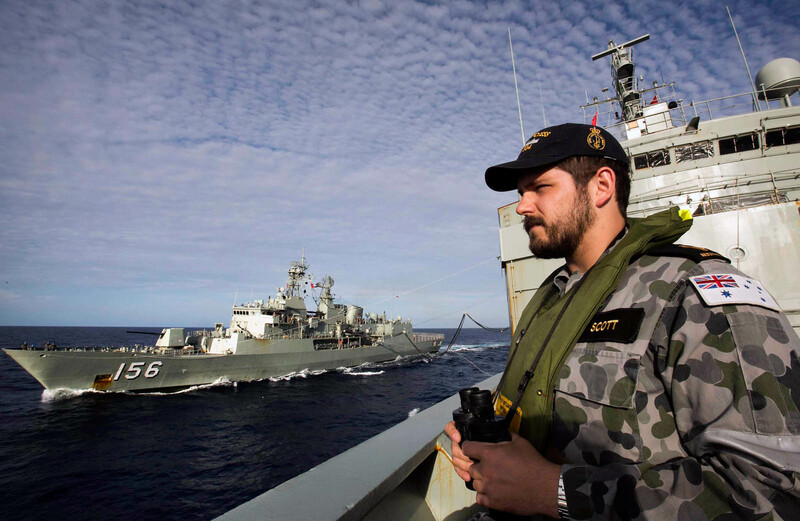 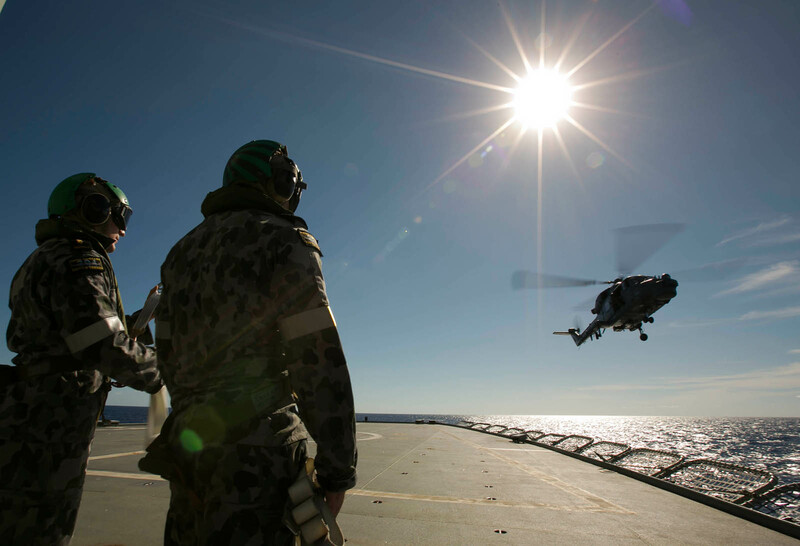 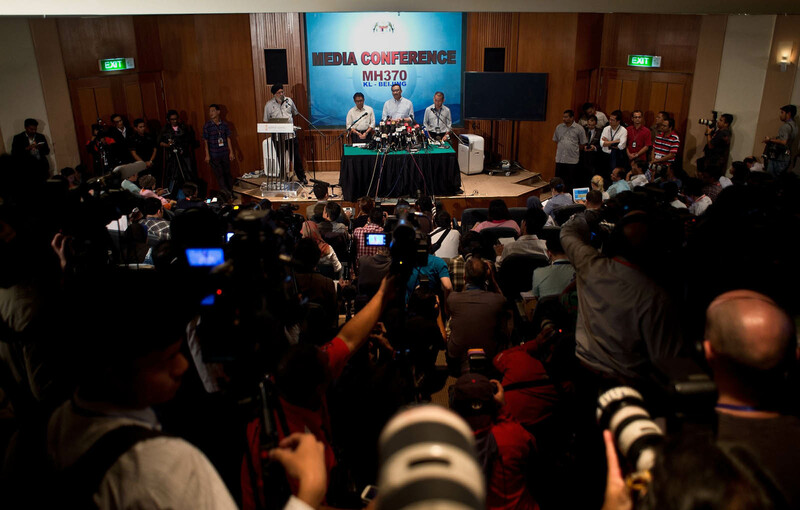 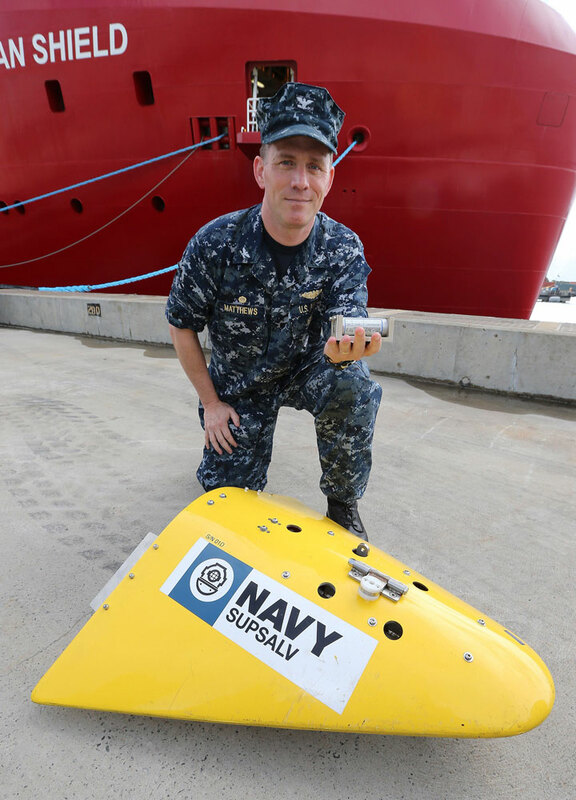 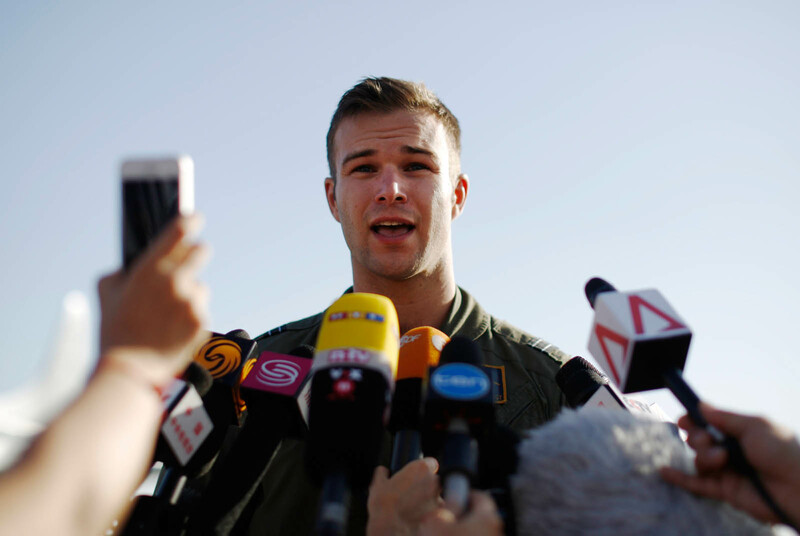 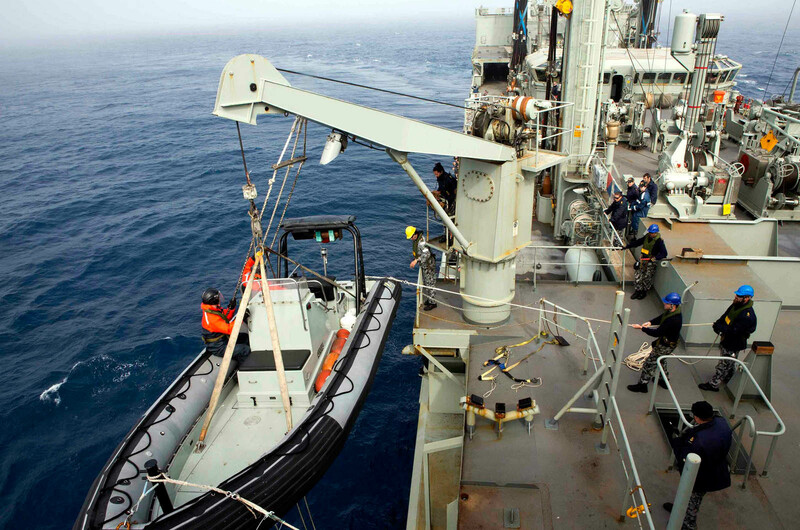 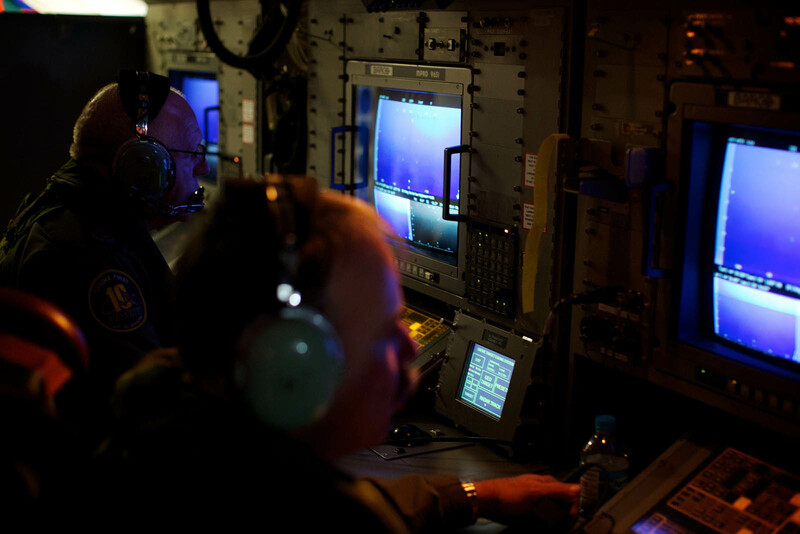 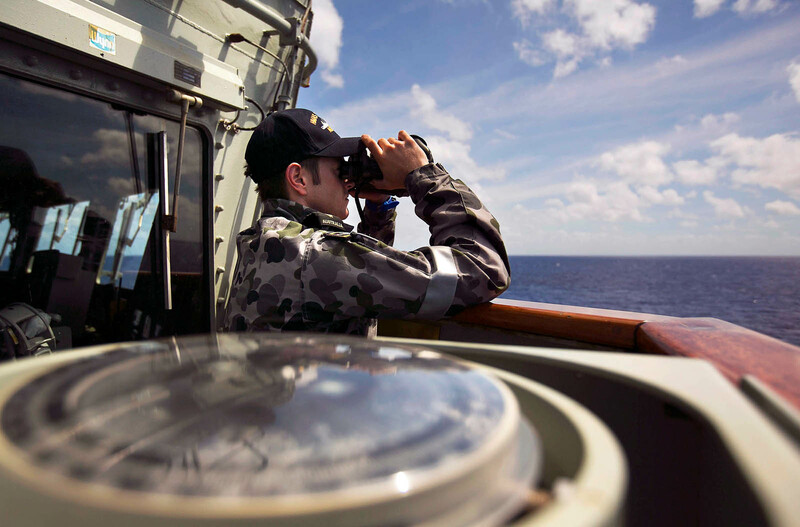 PERTH - Australian rescue officials broadened the search area for missing Malaysian flight MH370 on Saturday and boosted the number of spotter planes looking for it in the Indian Ocean, with weather conditions favourable. 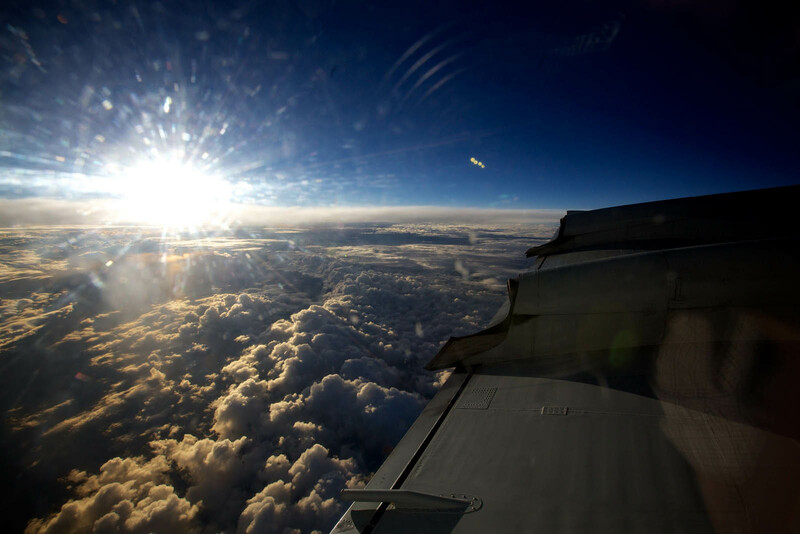 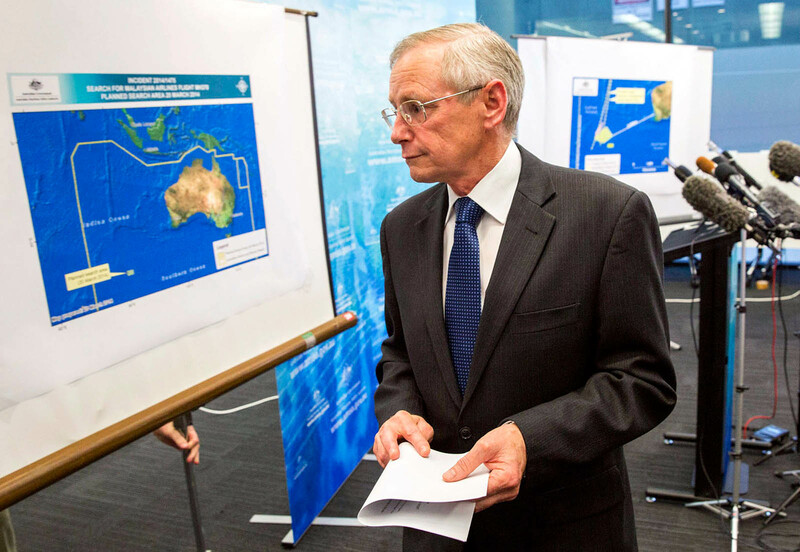 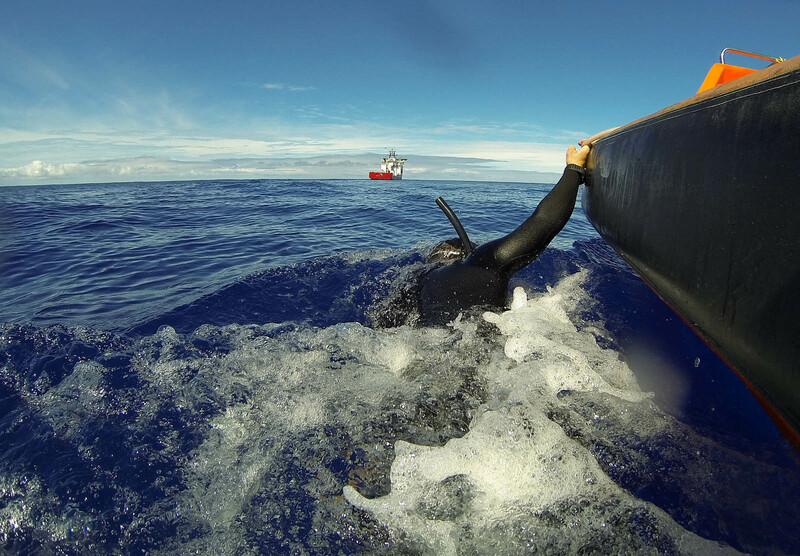 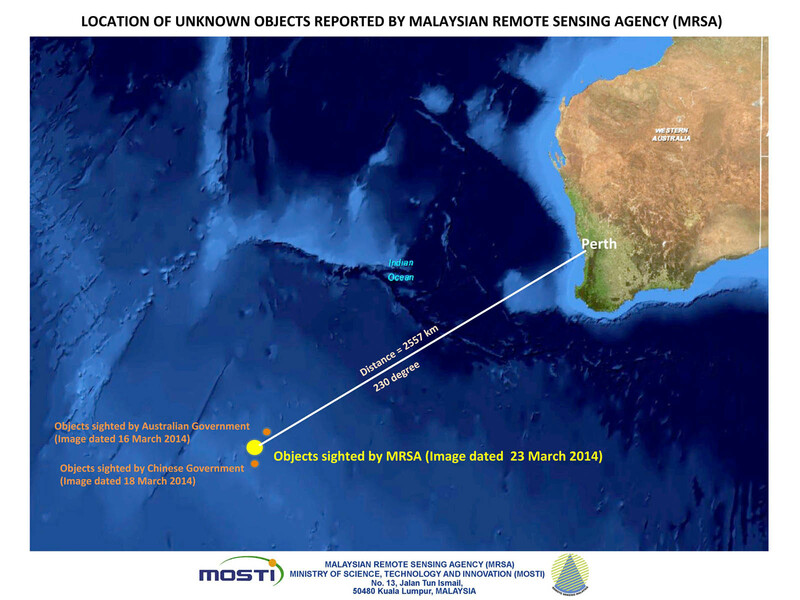 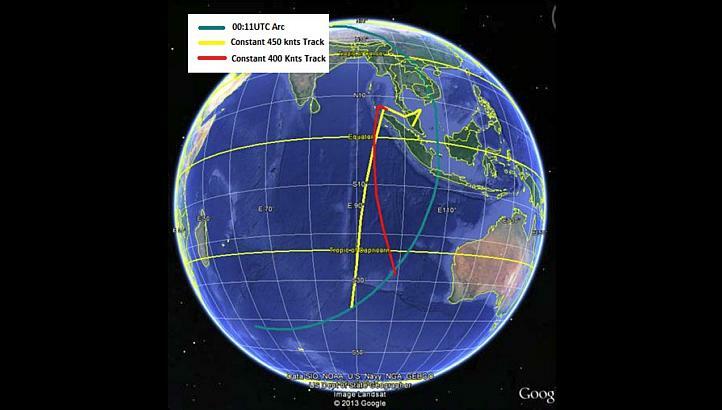 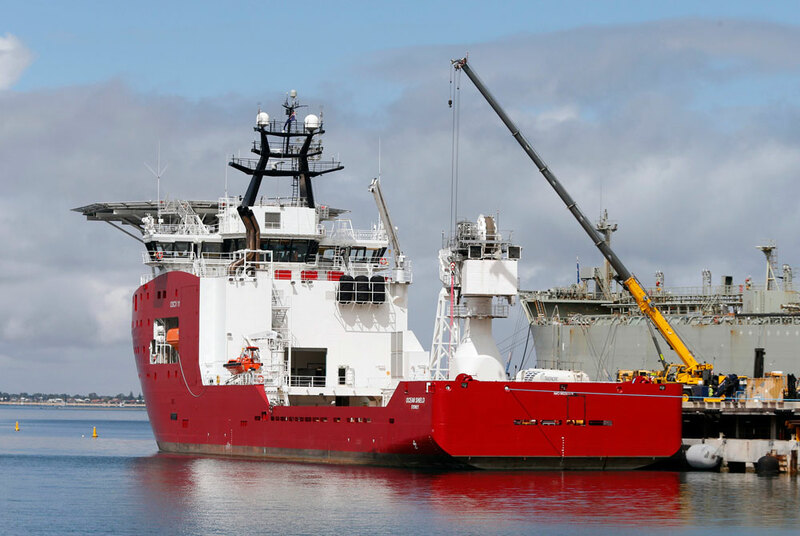 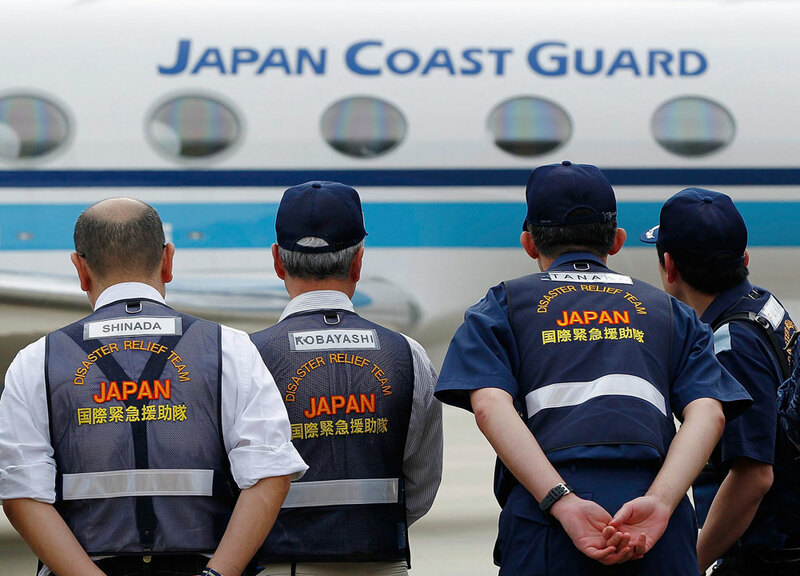 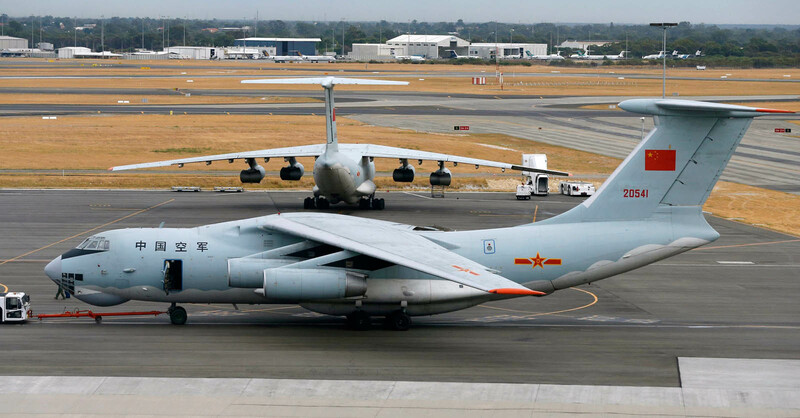 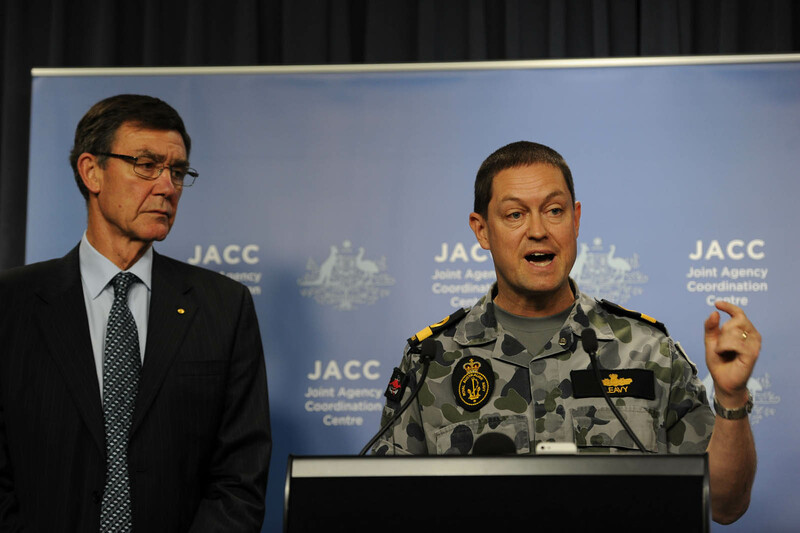 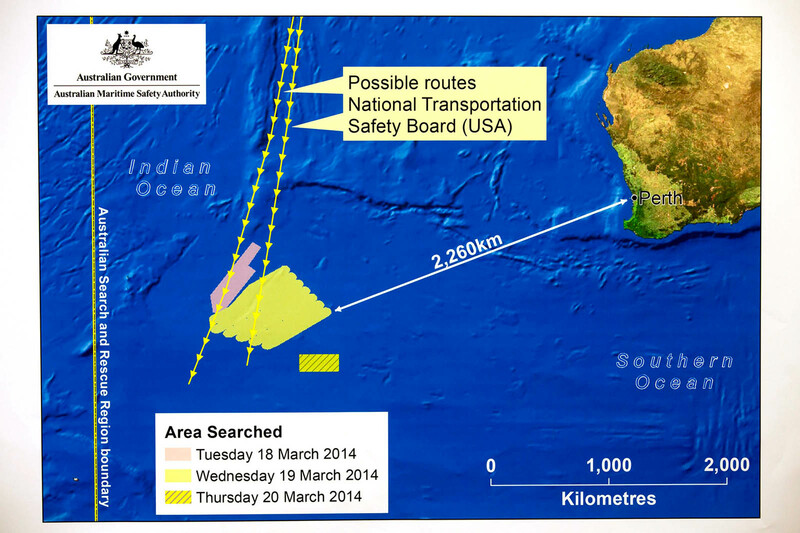 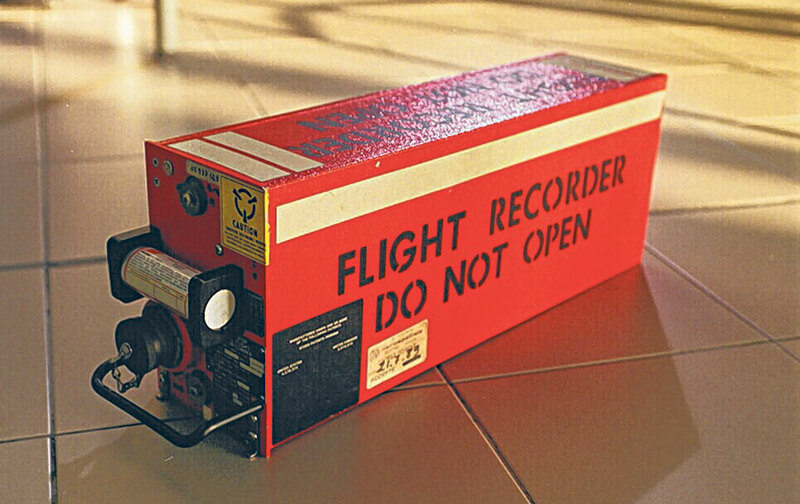 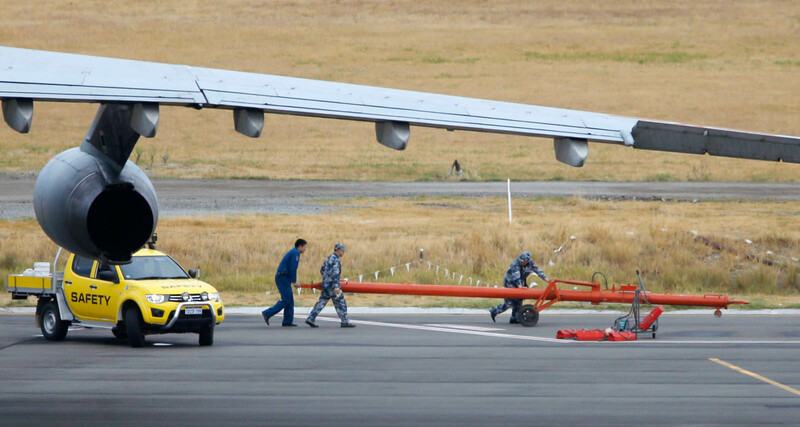 The Australian Maritime Safety Authority (AMSA) is coordinating the hunt in the vast southern search corridor for the jet that vanished on March 8, focusing for a third day on an area of wild and remote sea 2,500km south-west of Perth. 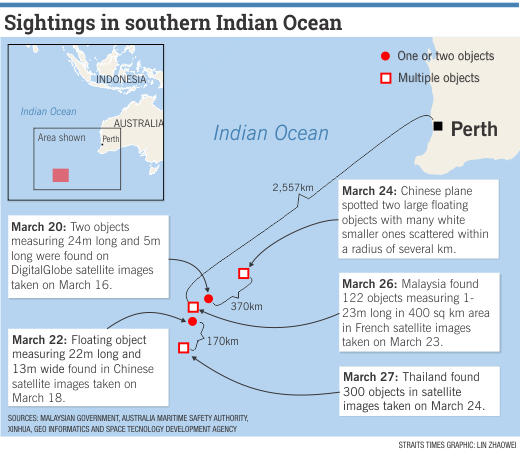 On Friday, five planes criss-crossed 23,000 sq km without any sightings of wreckage, and the search area has now been widened. 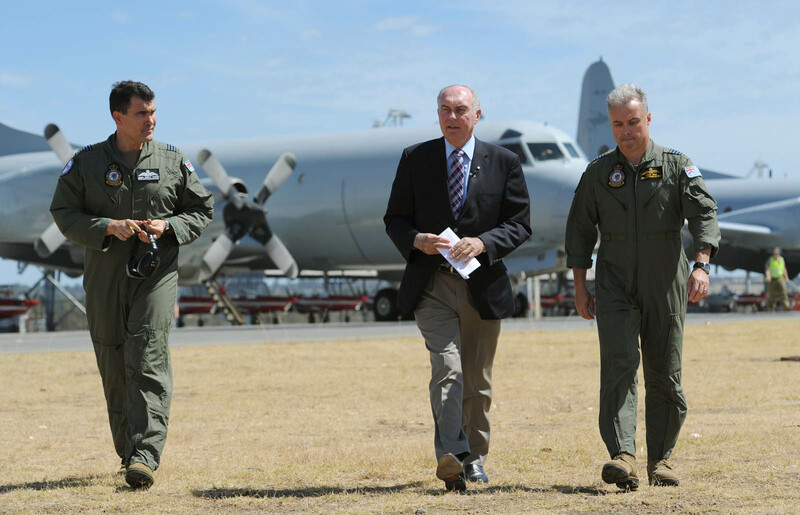 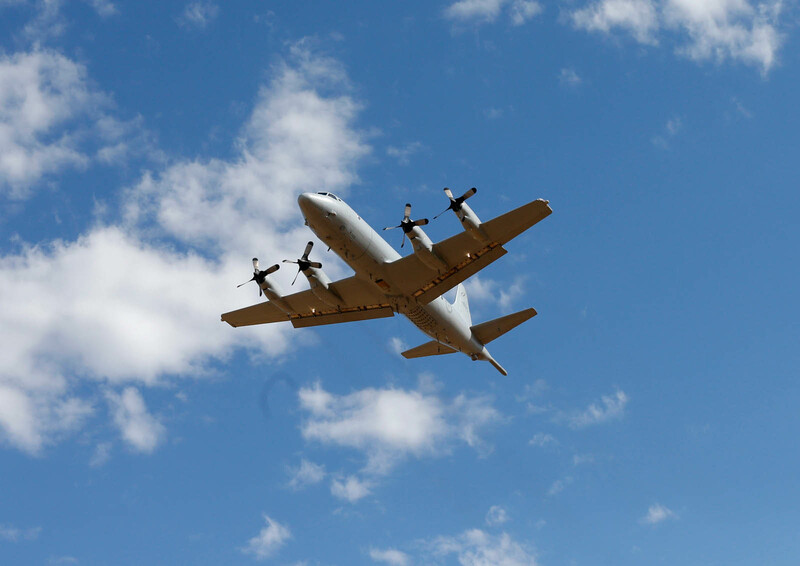 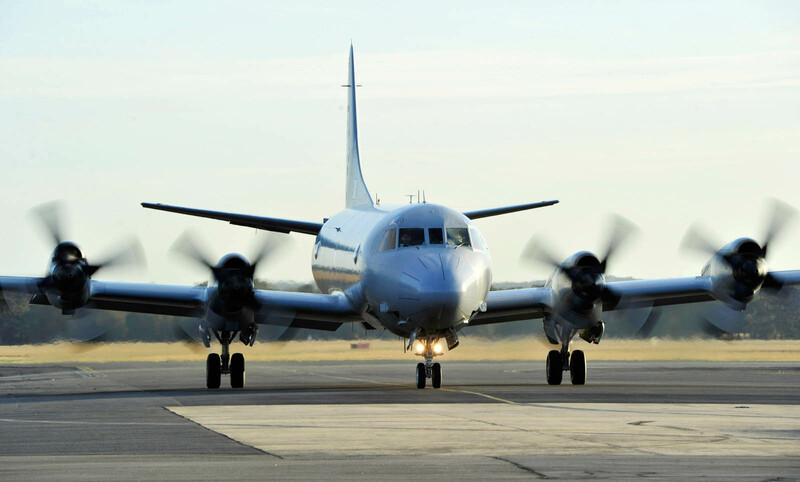 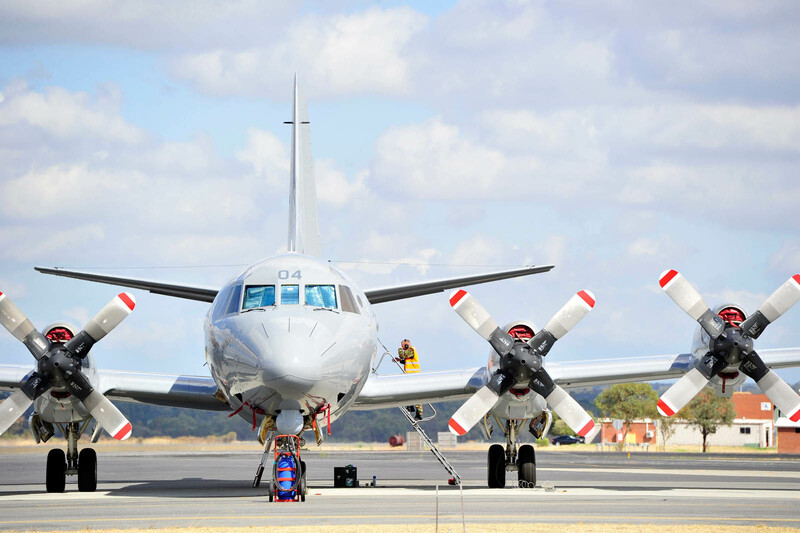 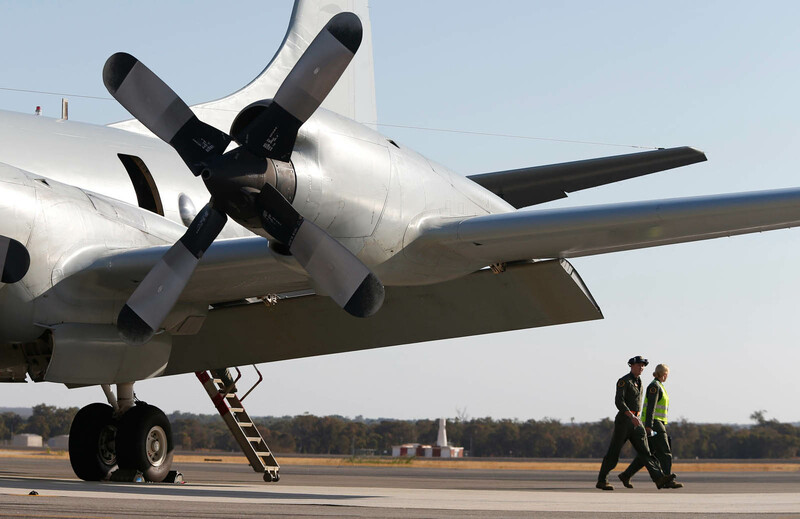 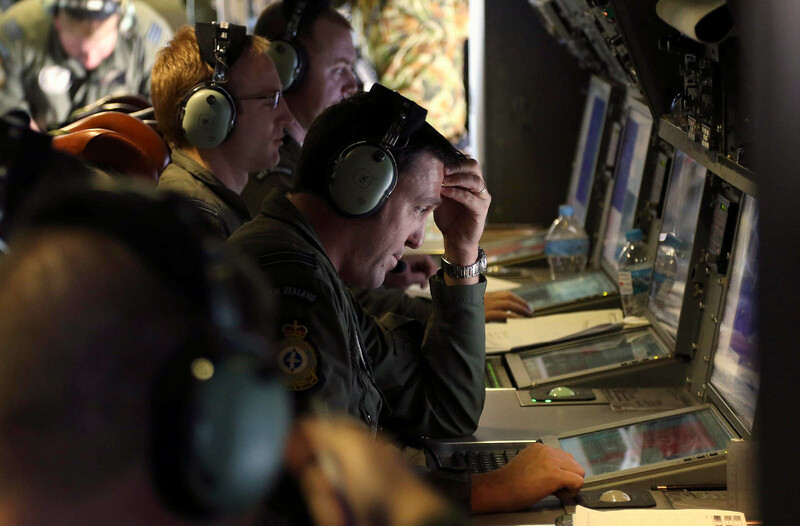 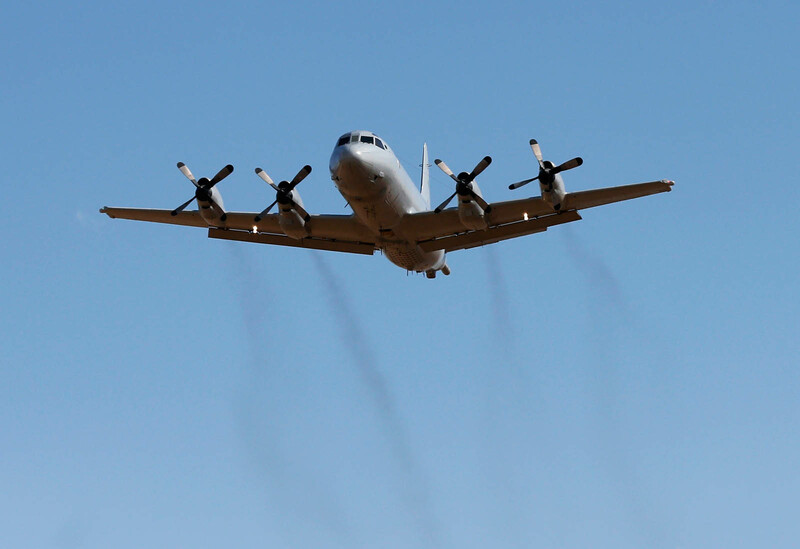 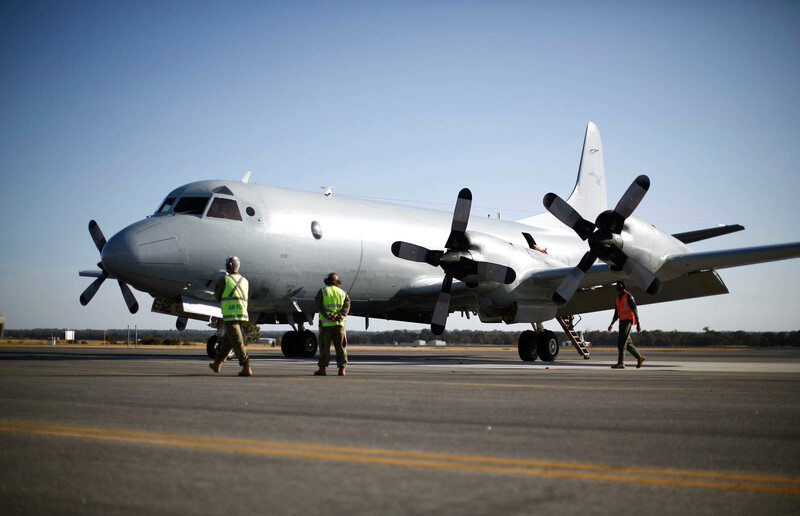 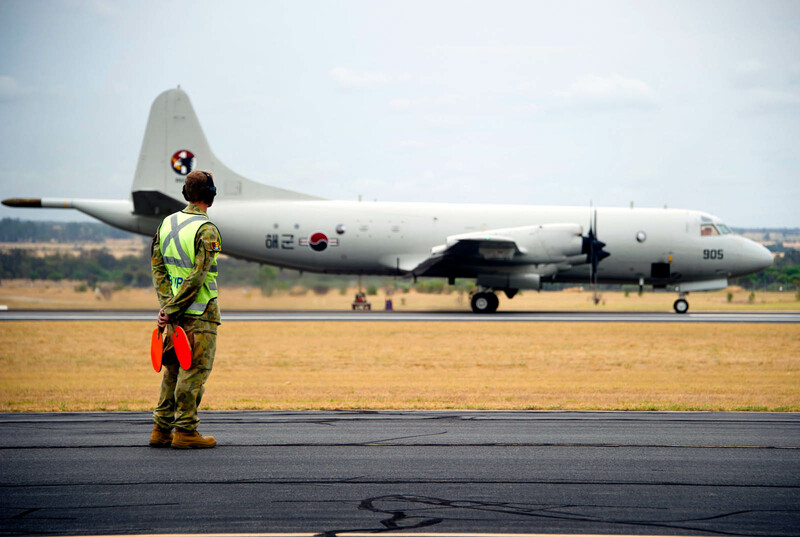 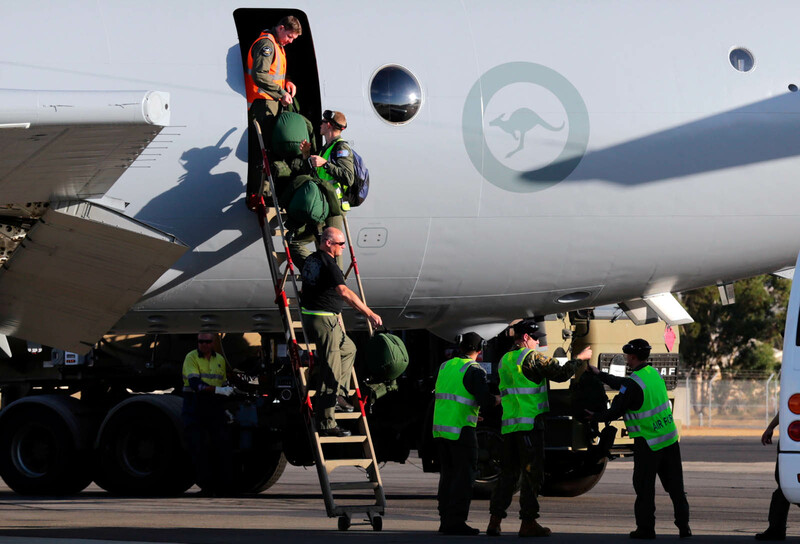 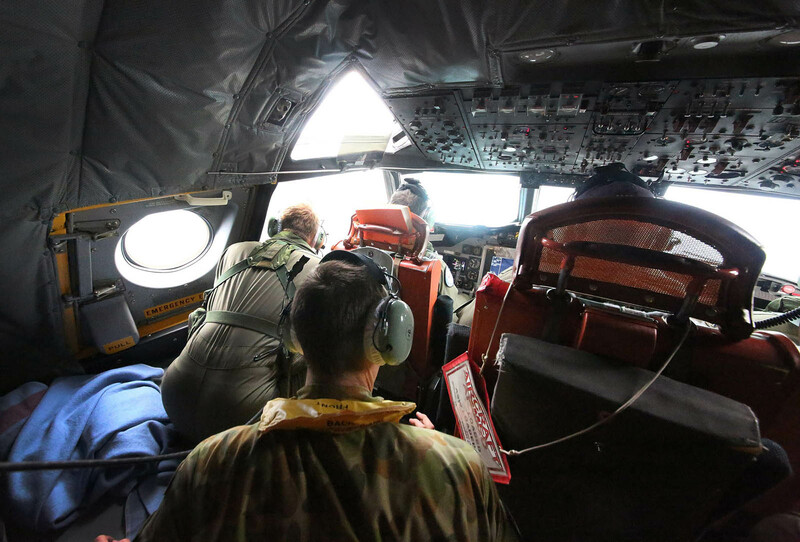 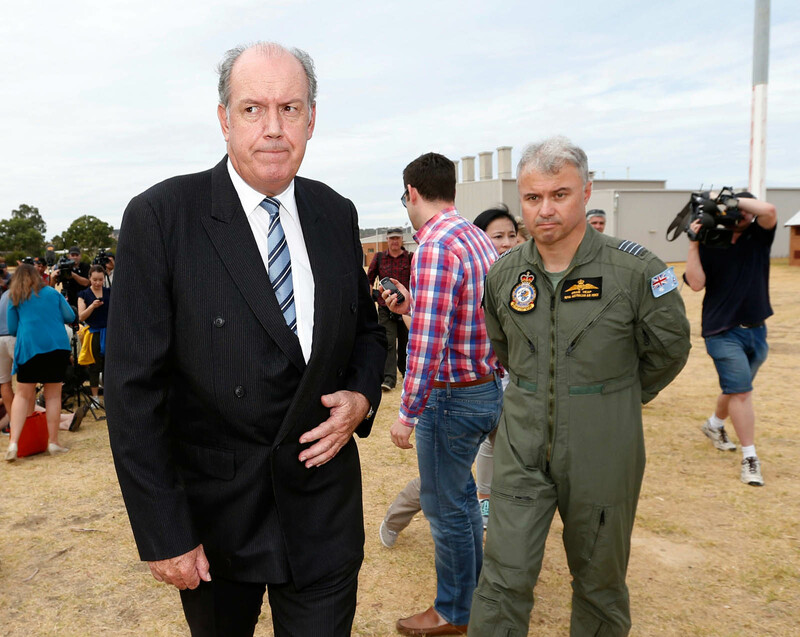 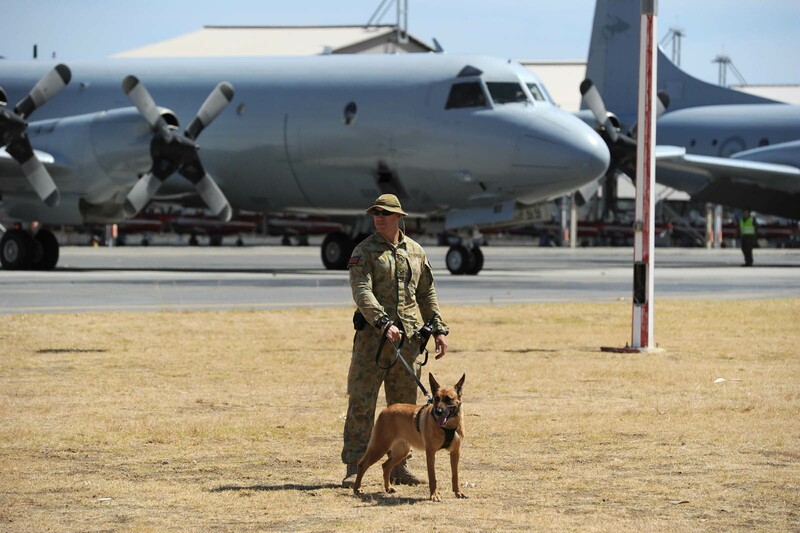 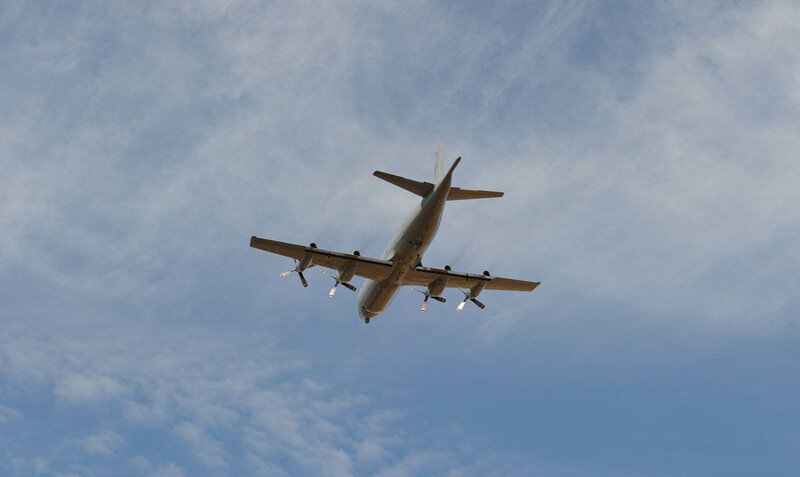 "AMSA has tasked three RAAF P3 Orion aircraft, a New Zealand P3 RAAF Orion aircraft and two ultra long range commercial jets to search a 36,000 sq km area about 2,500km south-west of Perth today," it said. 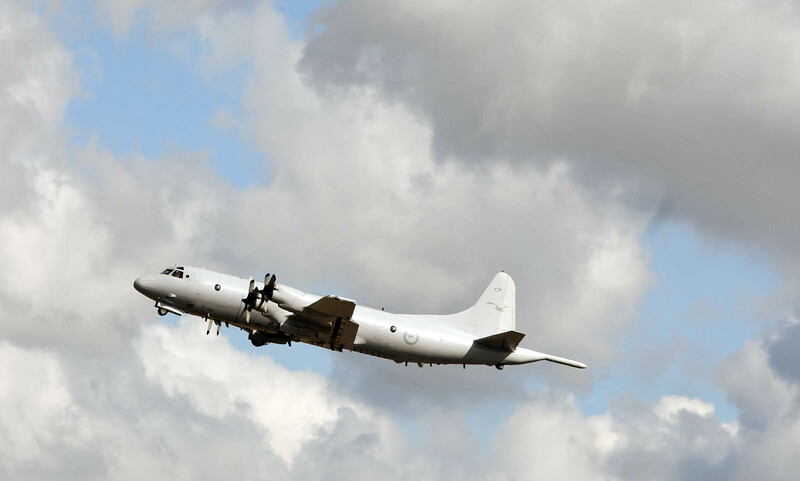 The commercial jets and one of the Orions left Perth at 2200 GMT for the four-hour flight to the zone of interest, with the others following later. 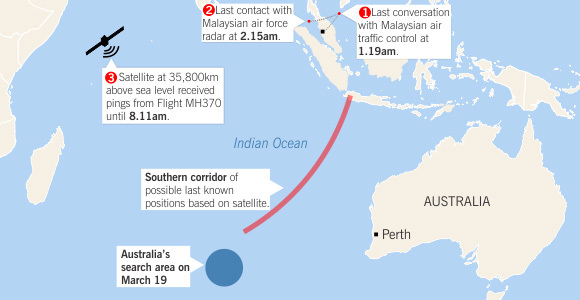 The distance from Australia's west coast allows the planes only about two hours of actual search time before they must turn around with enough fuel to get back to Perth. 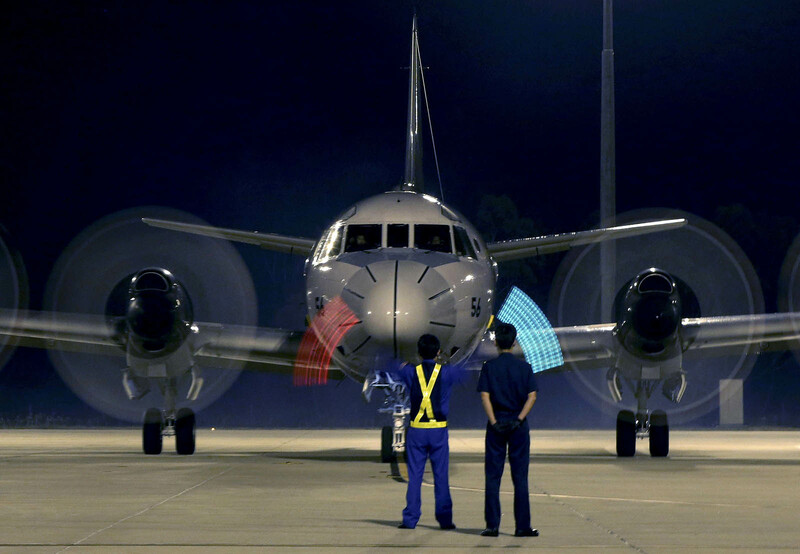 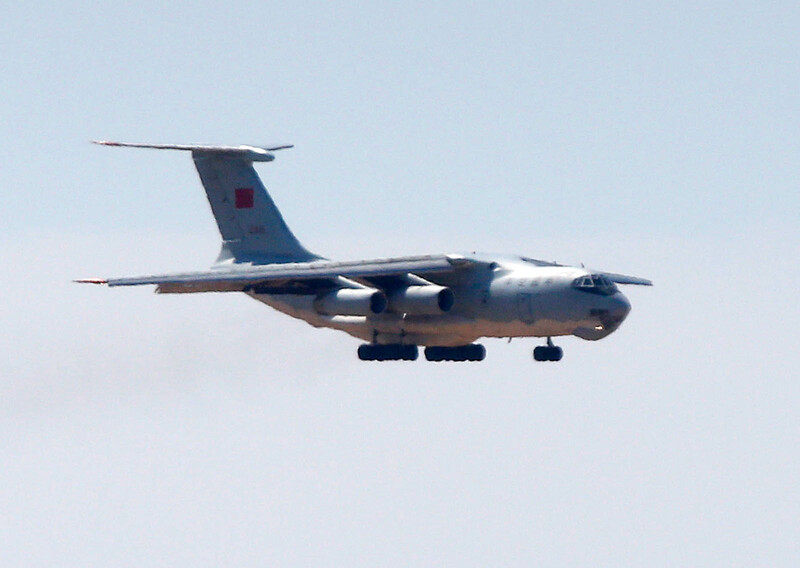 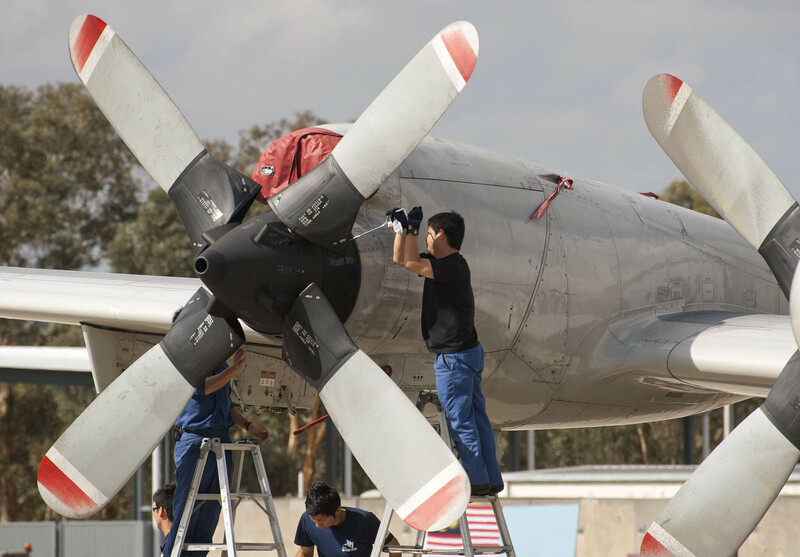 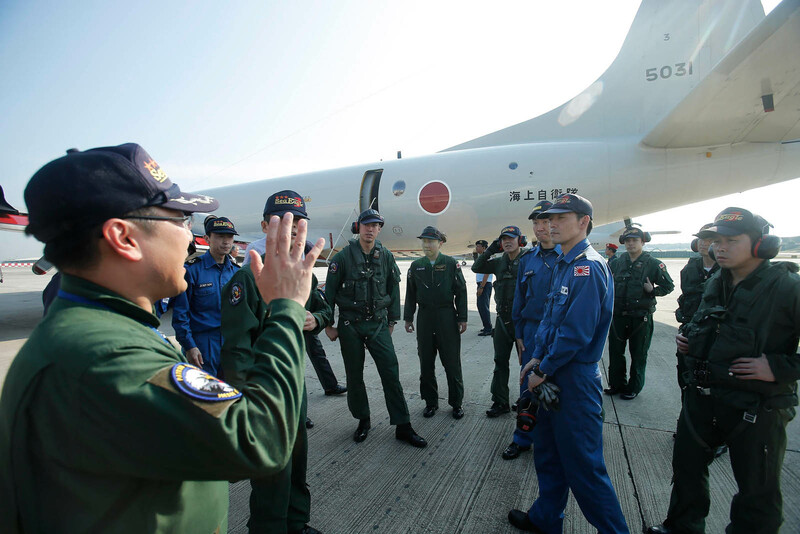 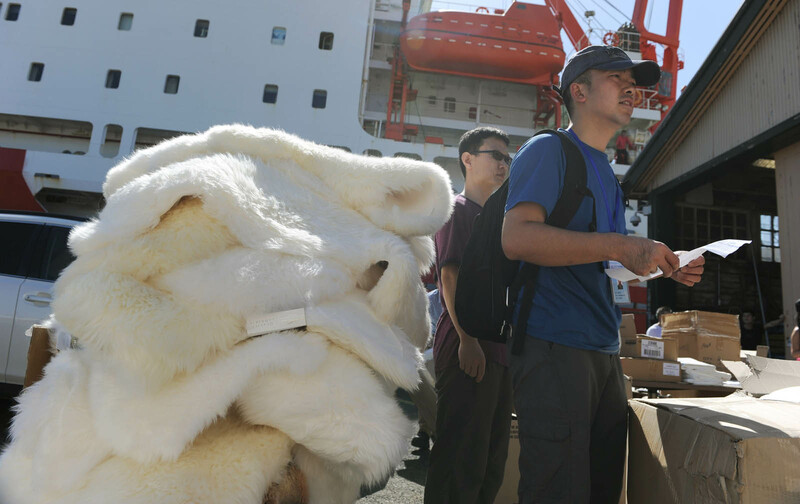 Planes from China and Japan are also expected to join the multinational air and sea hunt in coming days. 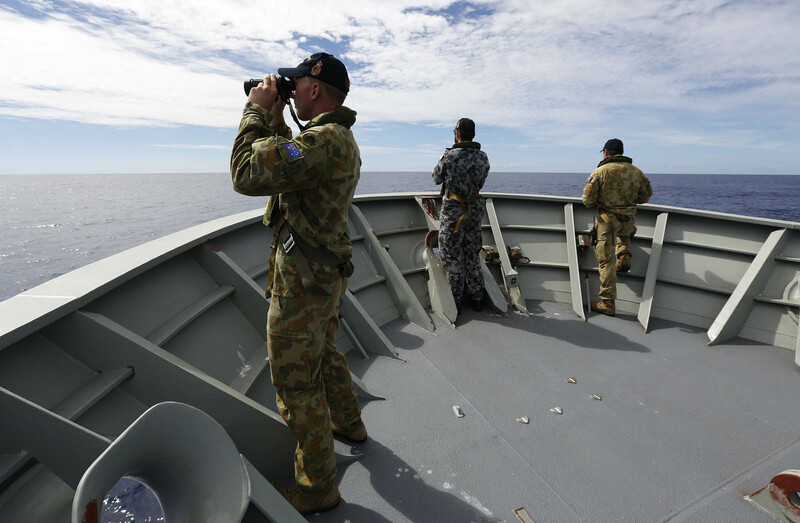 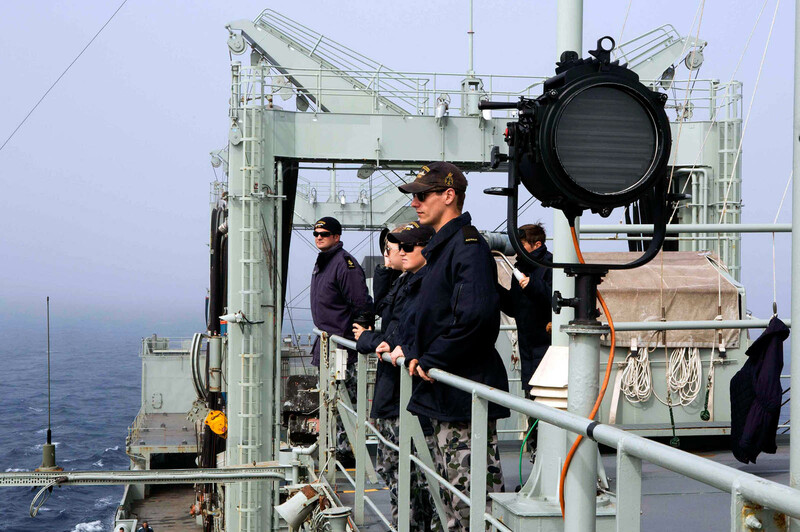 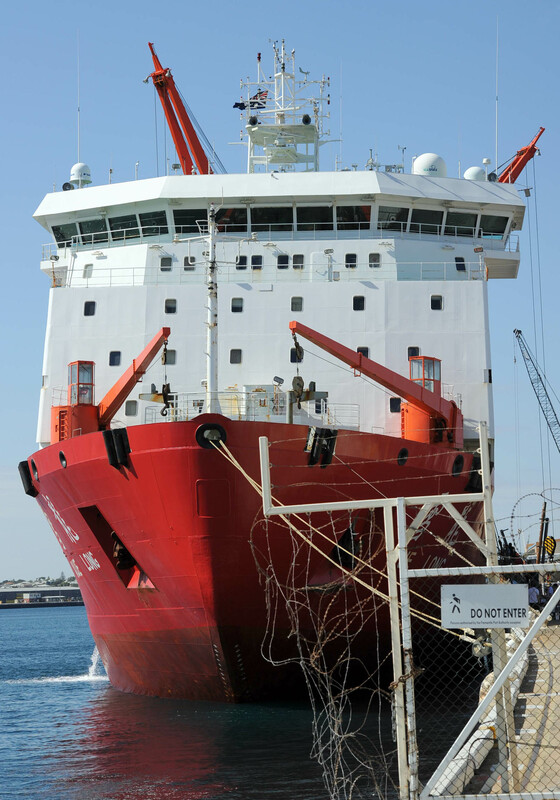 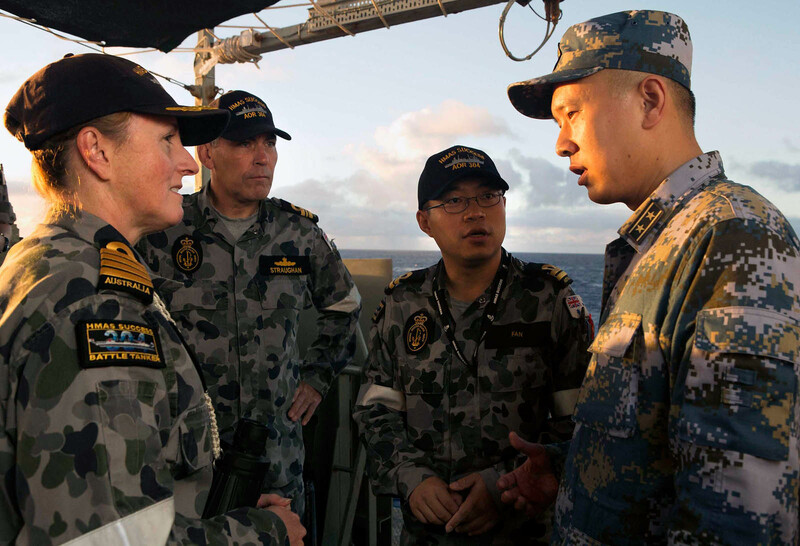 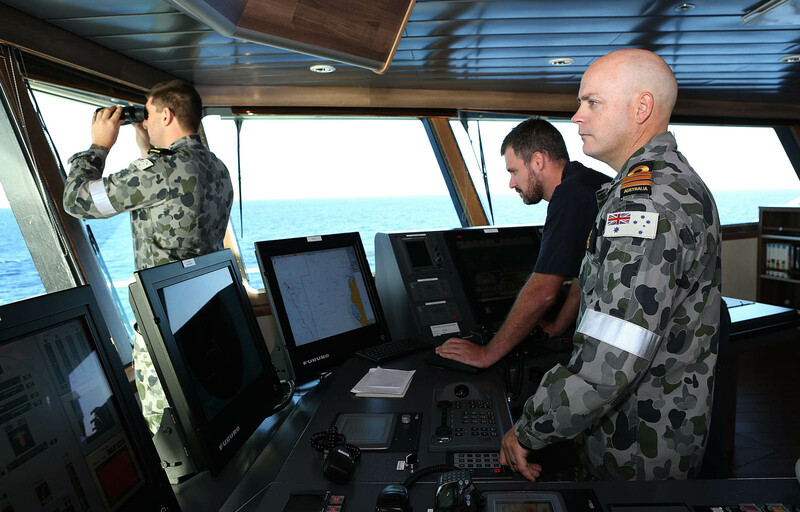 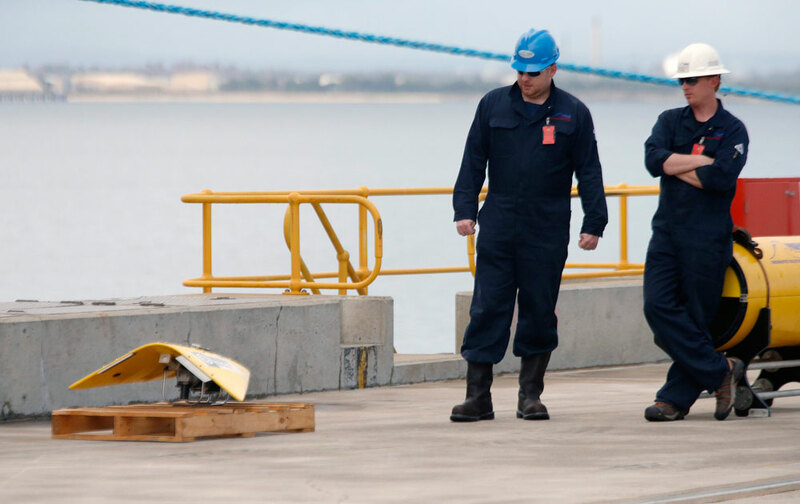 AMSA said two merchant ships were now in the area and Australian naval vessel HMAS Success, which is capable of picking up any wreckage, was due on the scene on Saturday afternoon. 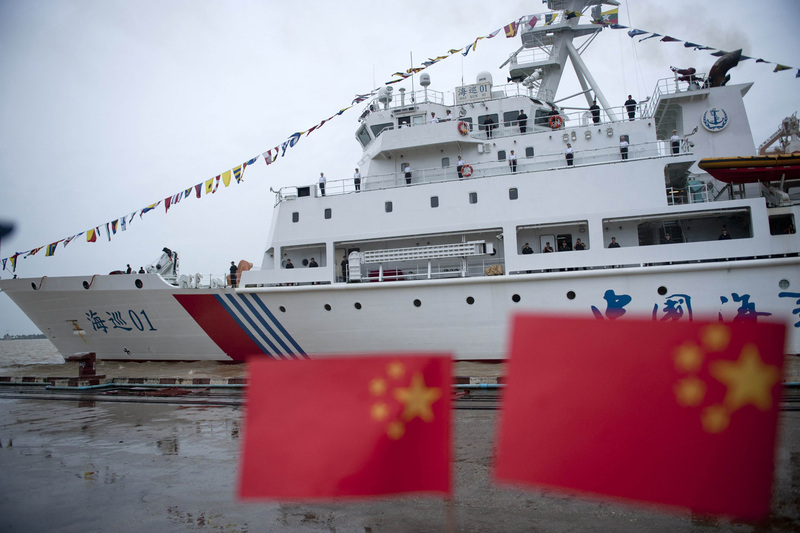 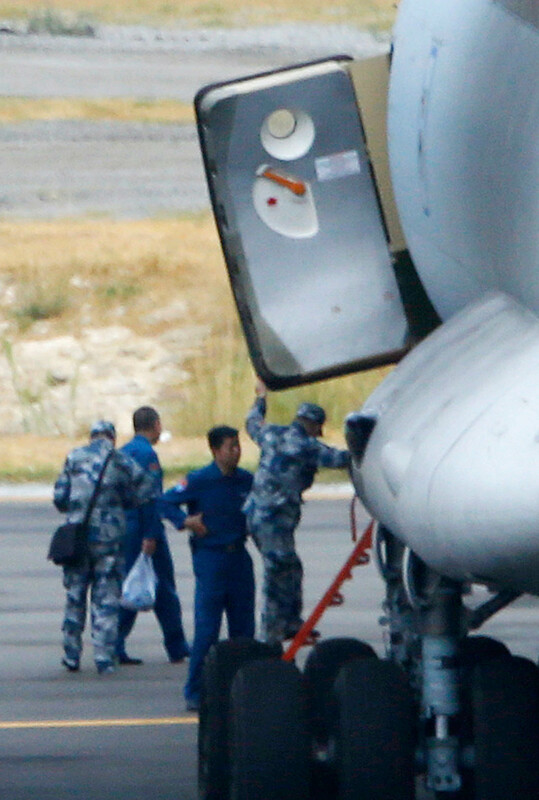 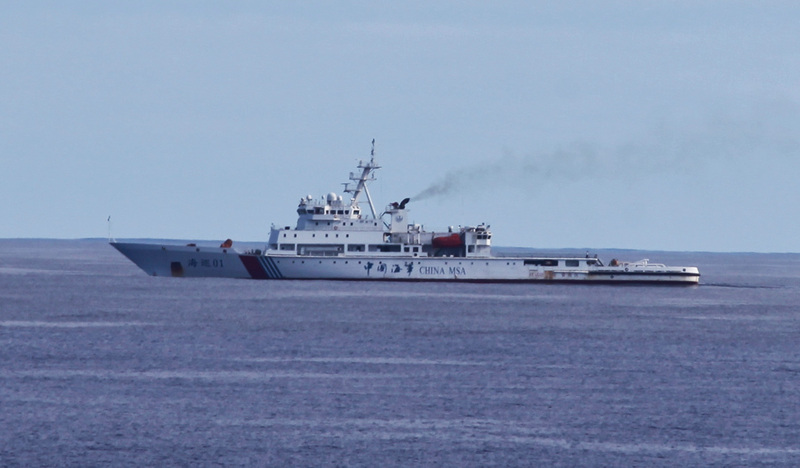 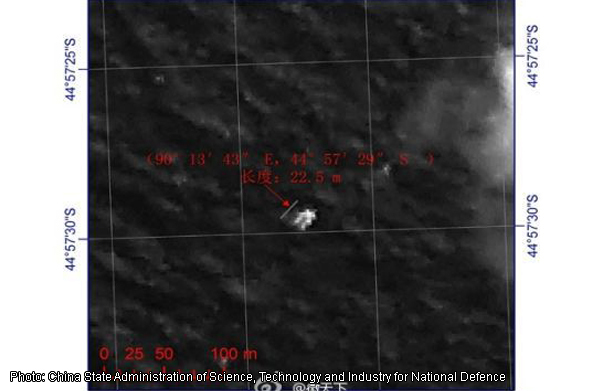 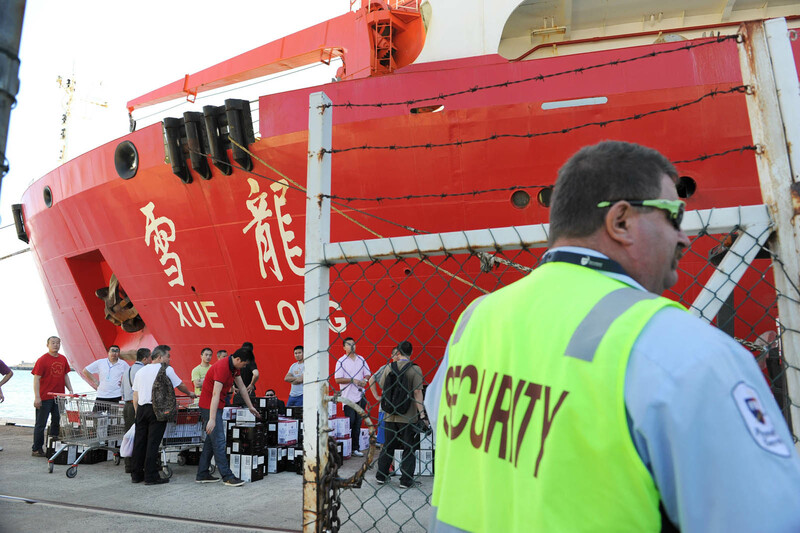 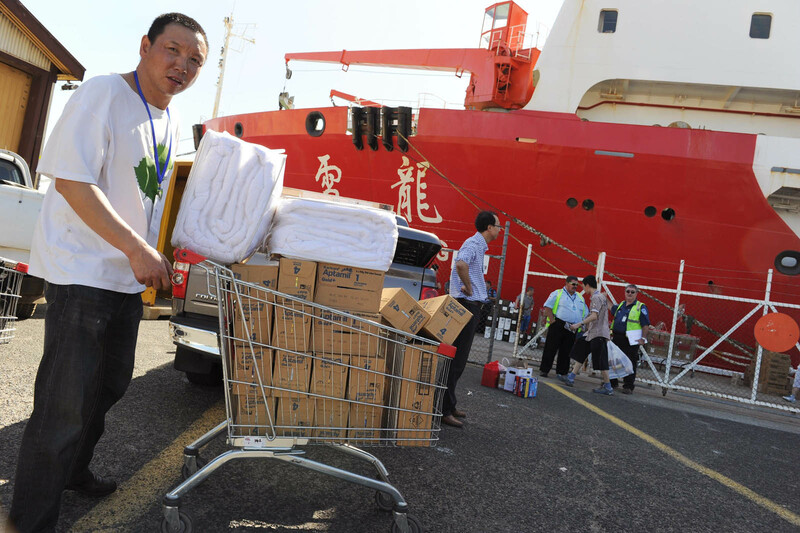 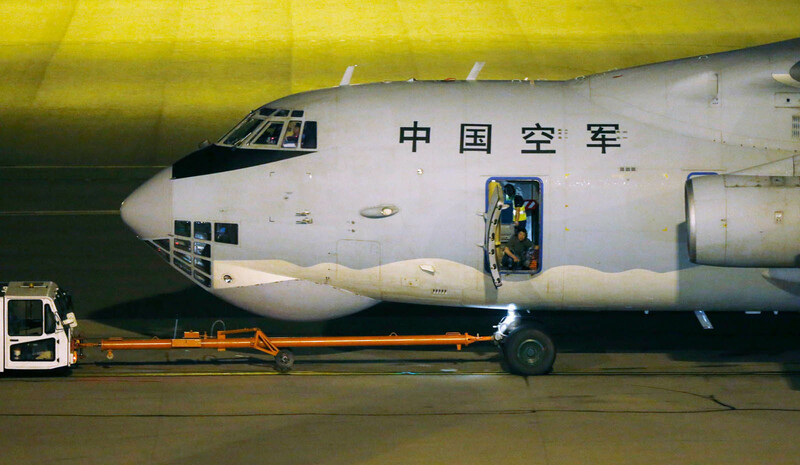 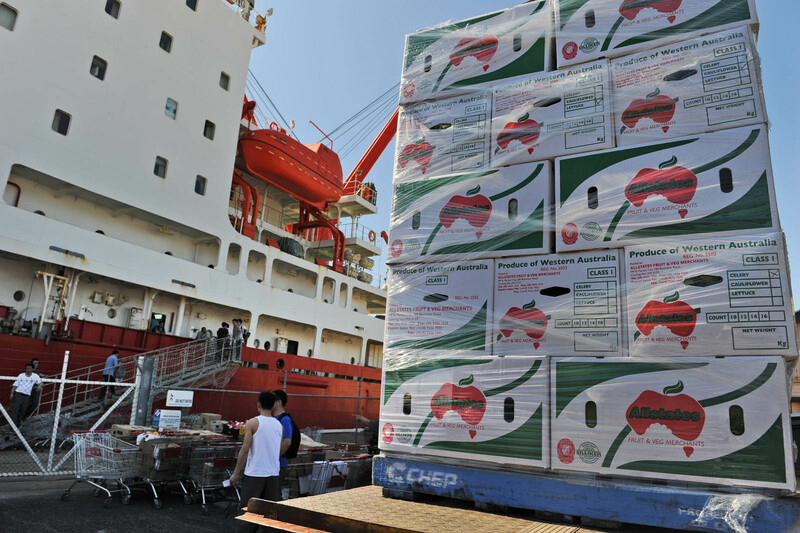 With 153 of 239 people on board the missing plane coming from China, Chinese authorities said at least seven Chinese ships were also steaming to the southern Indian Ocean, although it could be days before they arrive. 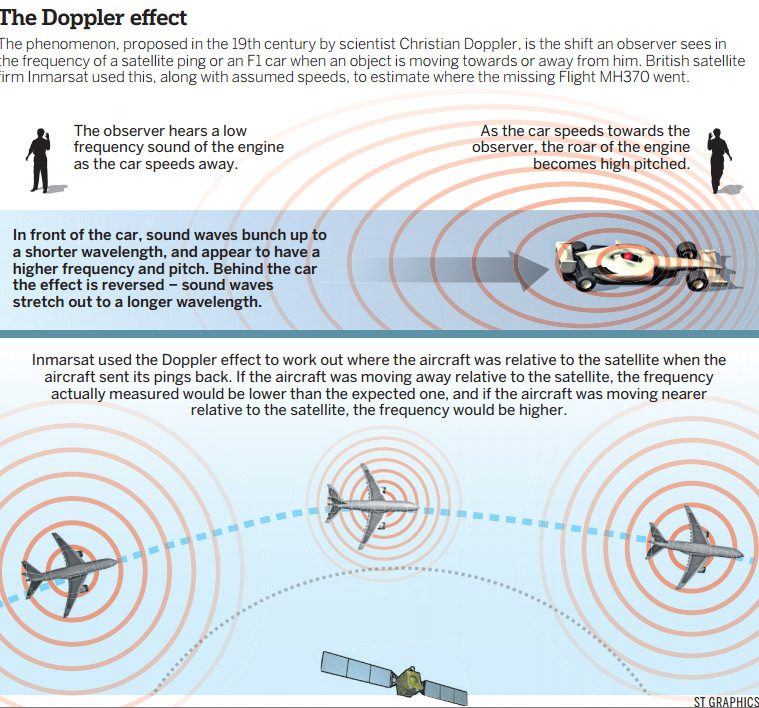 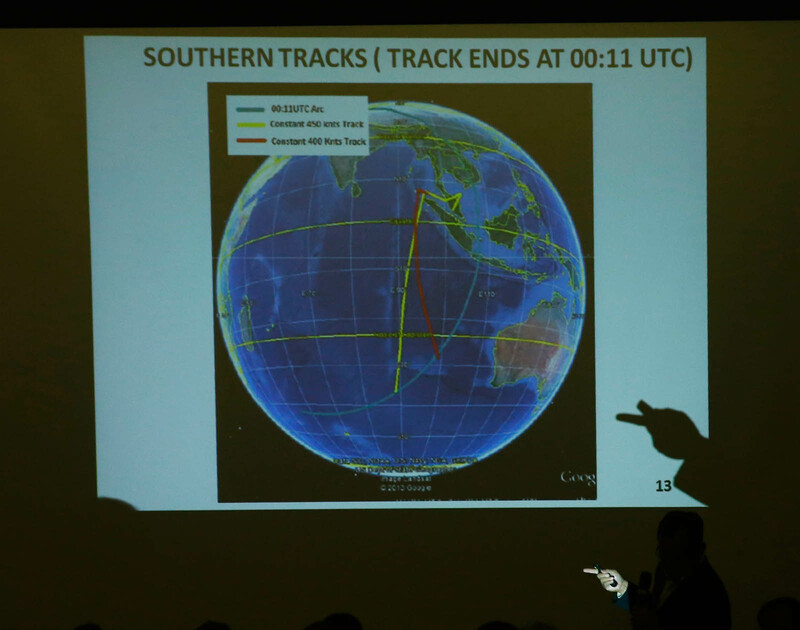 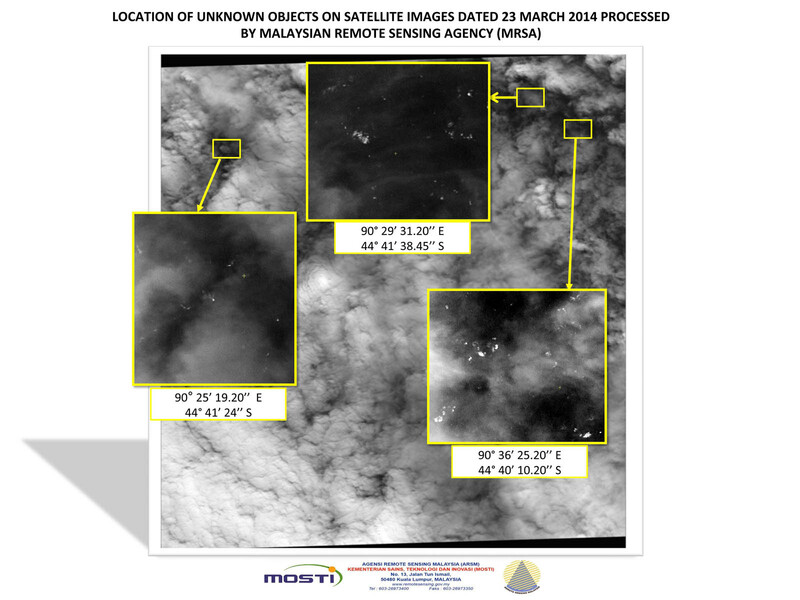 There have been no sightings of interest since Australia announced on Thursday that grainy satellite photos taken on March 16 had picked up two indistinct floating objects. 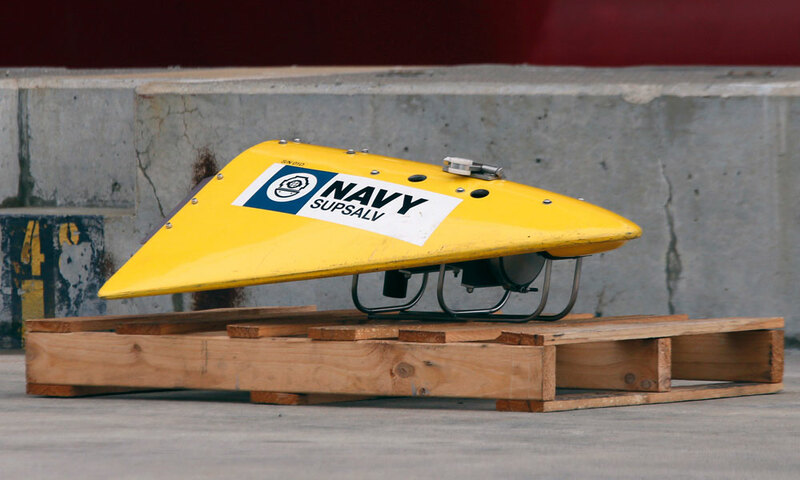 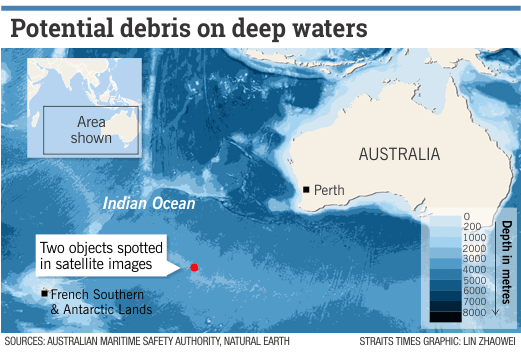 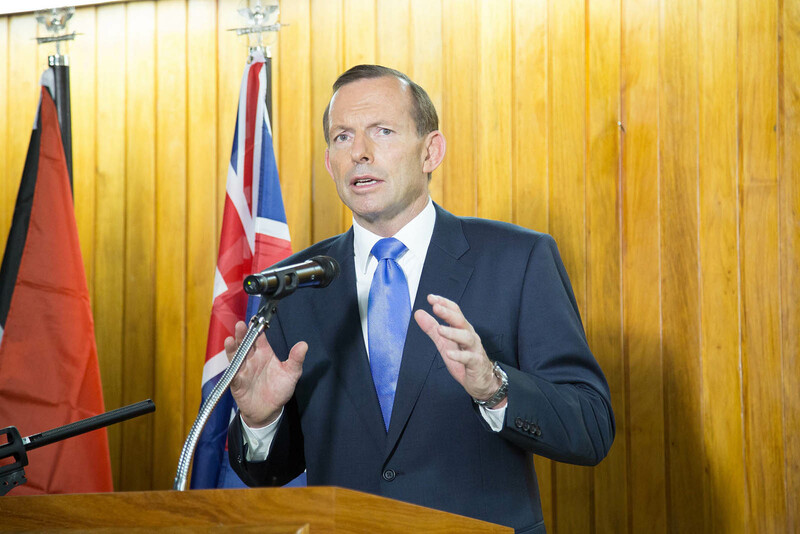 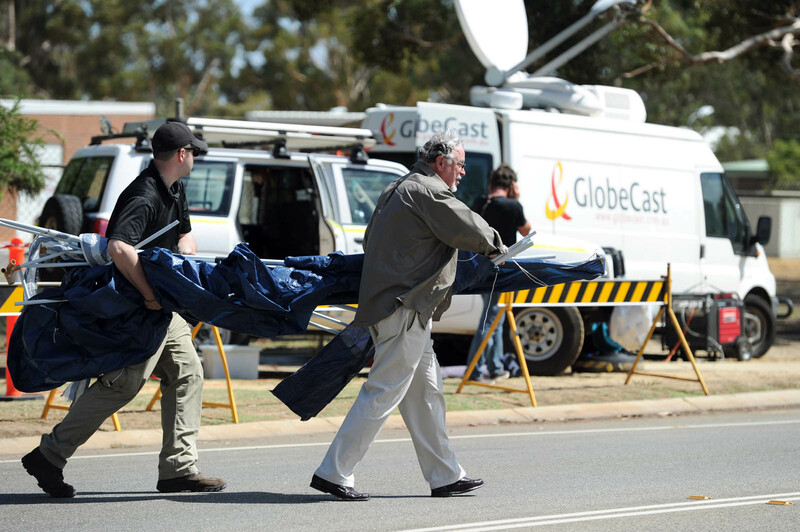 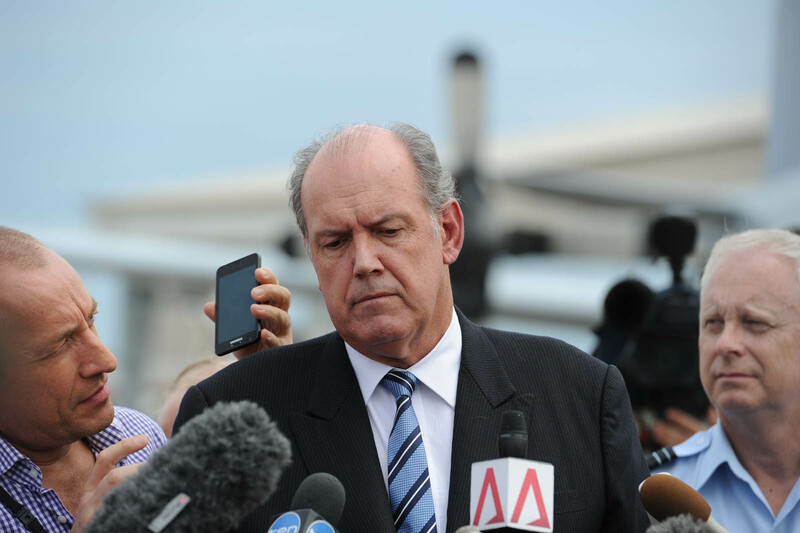 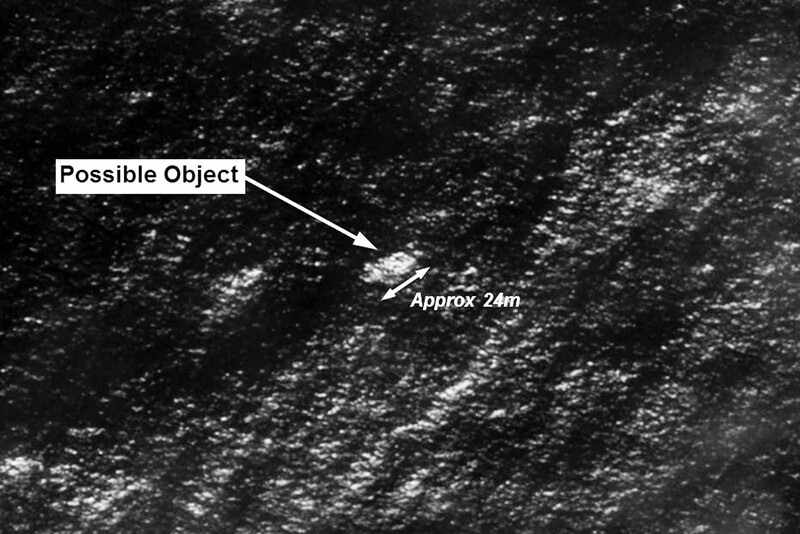 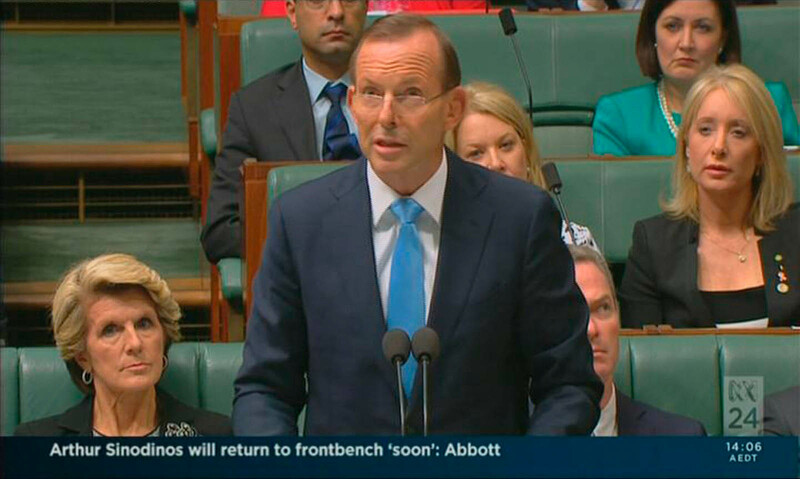 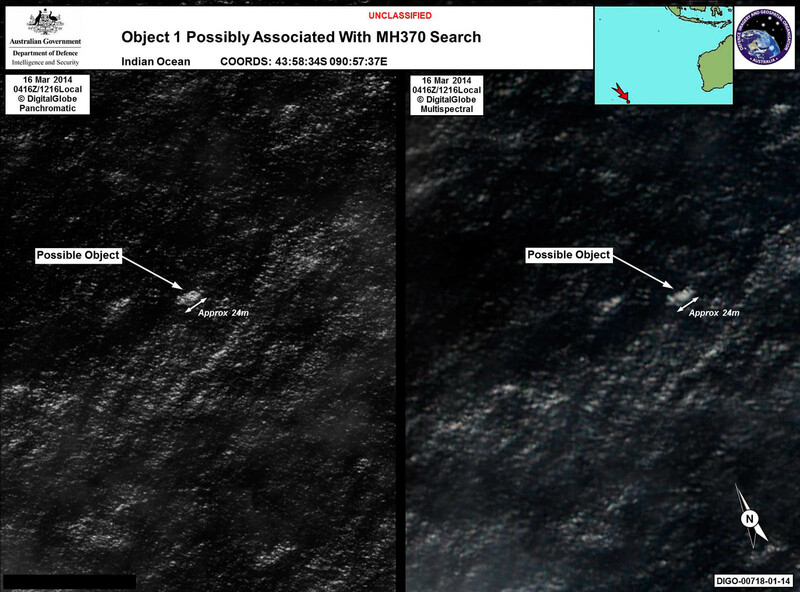 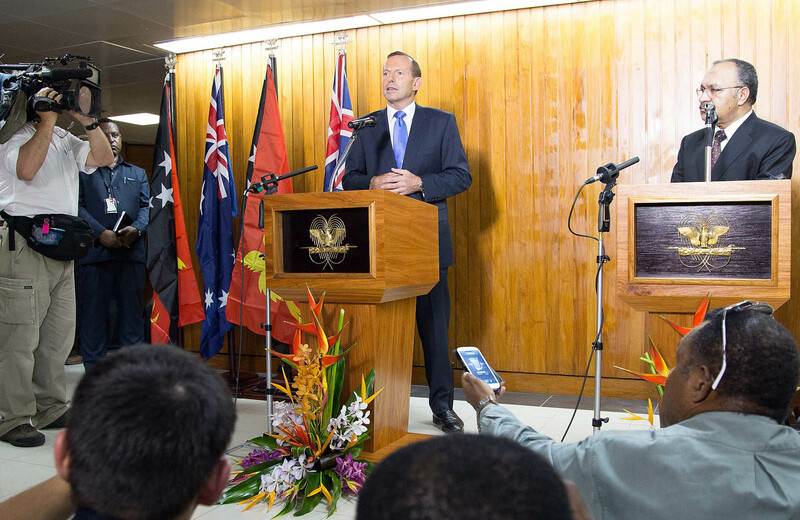 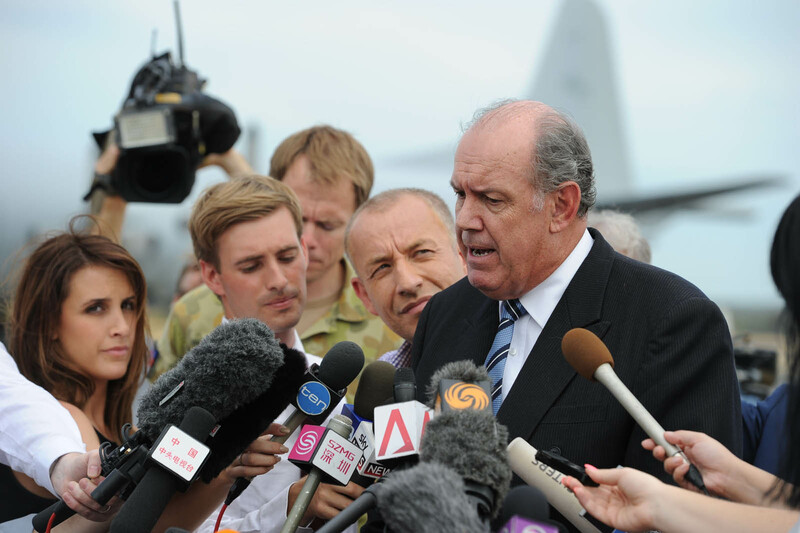 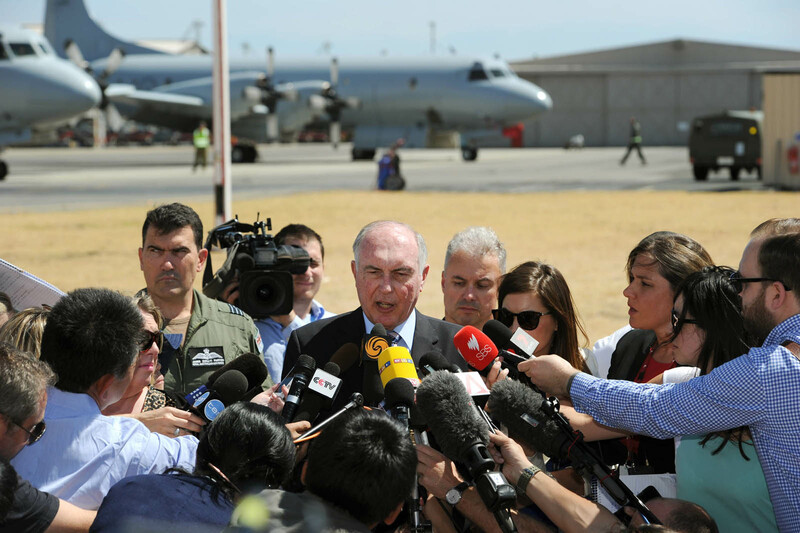 Australian Deputy Prime Minister Warren Truss cautioned that any possible debris may have sunk. 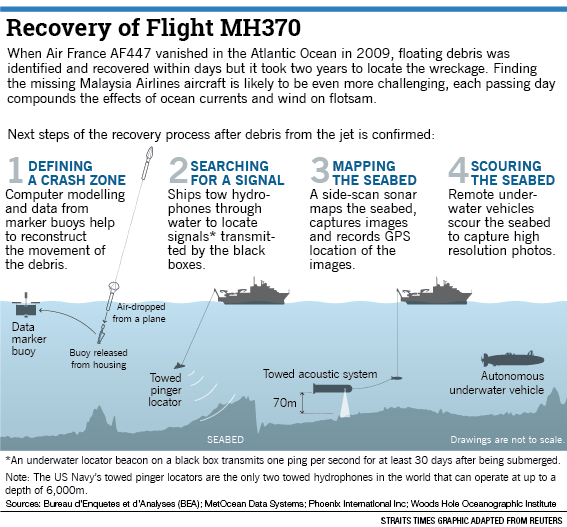 "Something that was floating on the sea that long ago may no longer be floating. 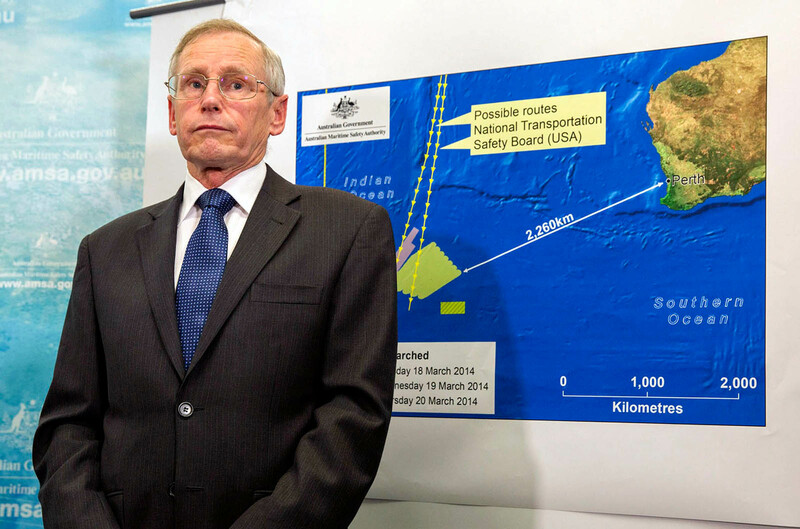 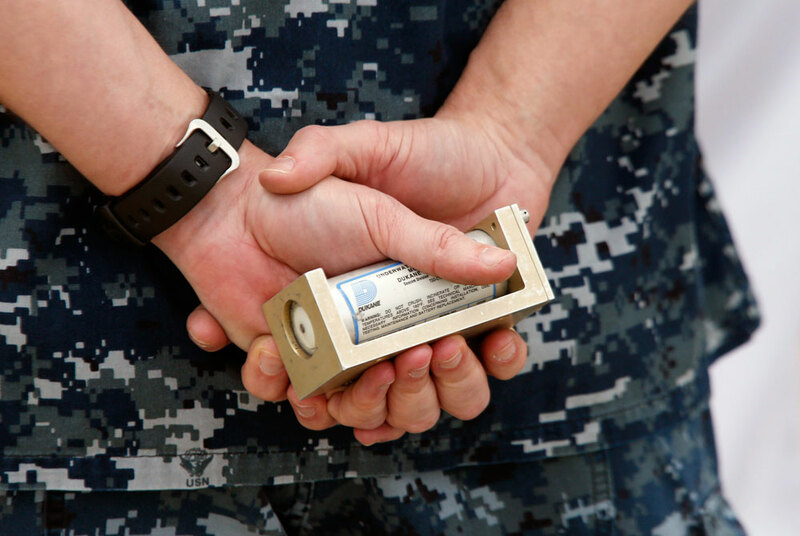 It may have slipped to the bottom," he said. 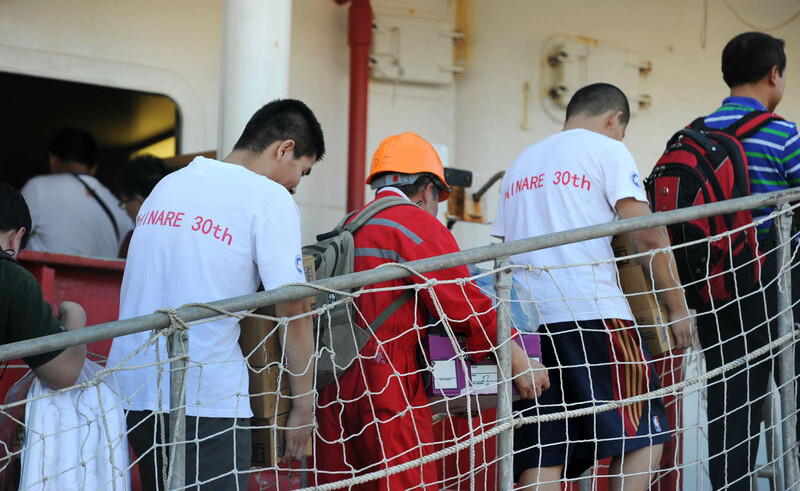 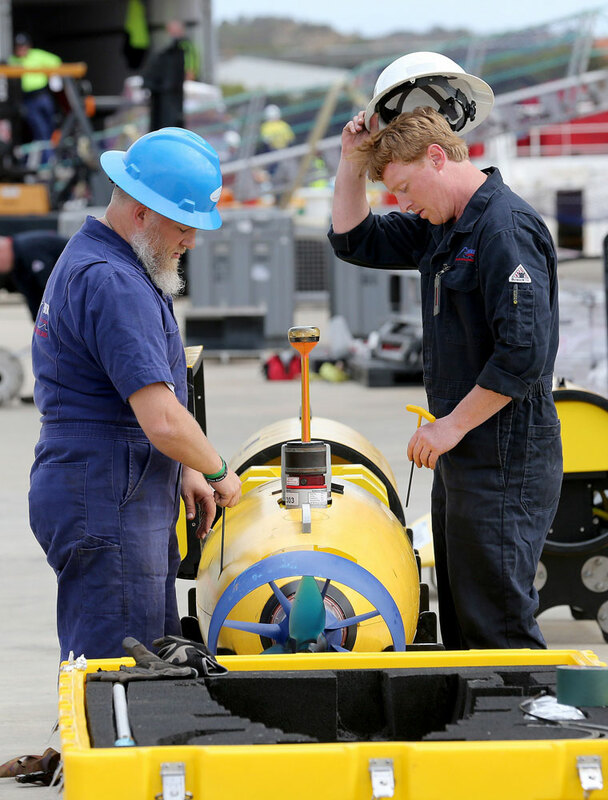 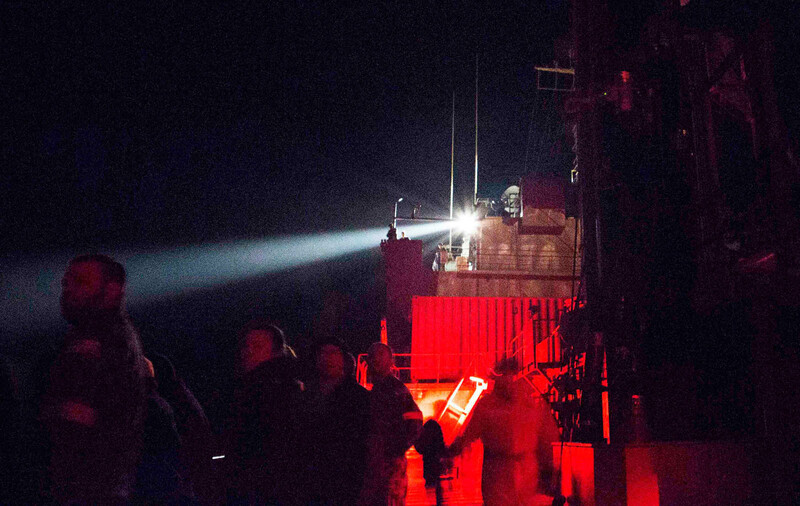 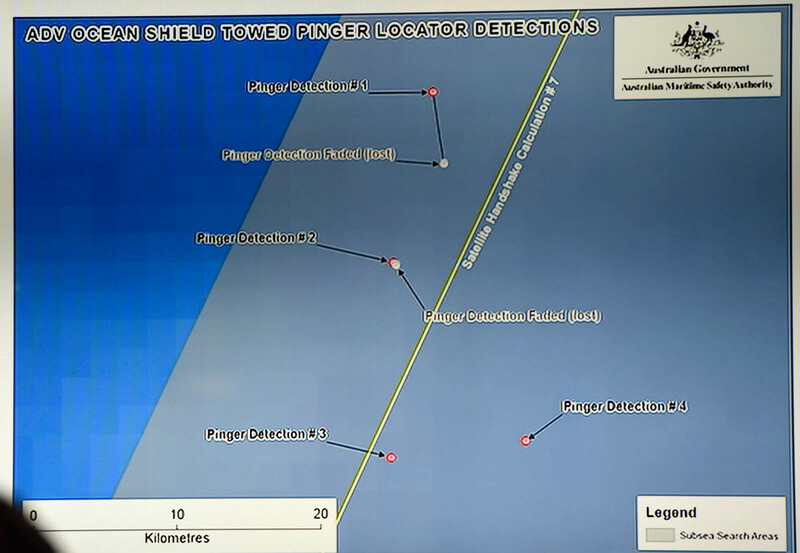 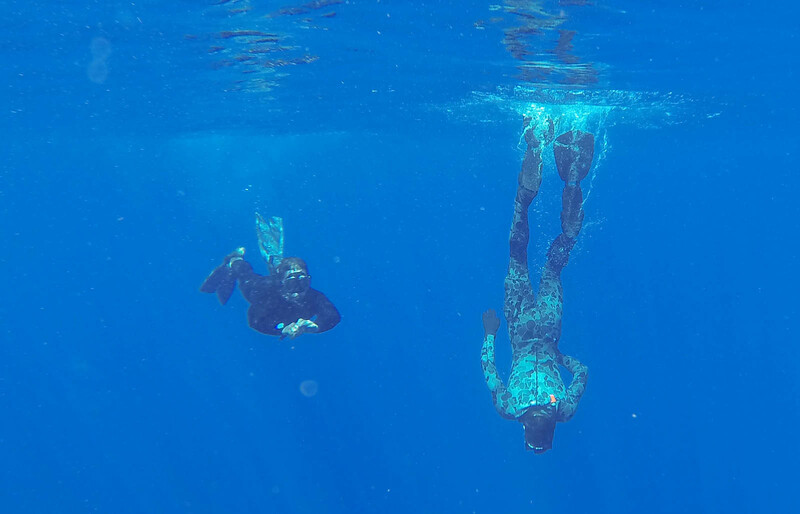 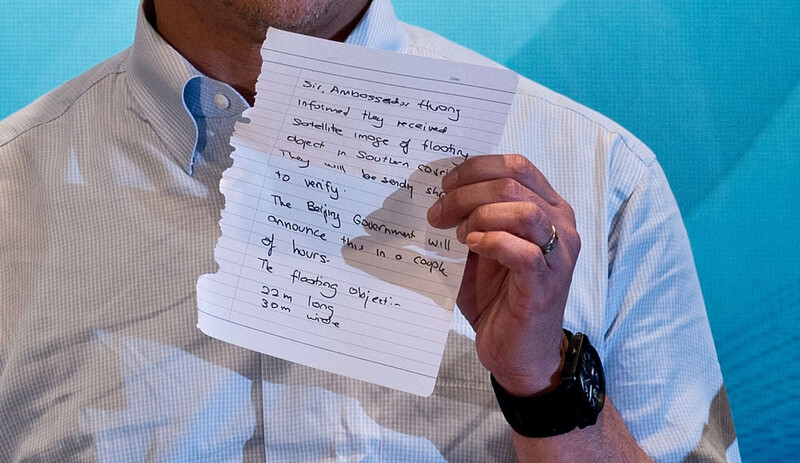 Poor weather initially hampered the search but forecasters said conditions appeared good for Saturday "The area will have pretty much light surface winds, generally less than about 10 knots. 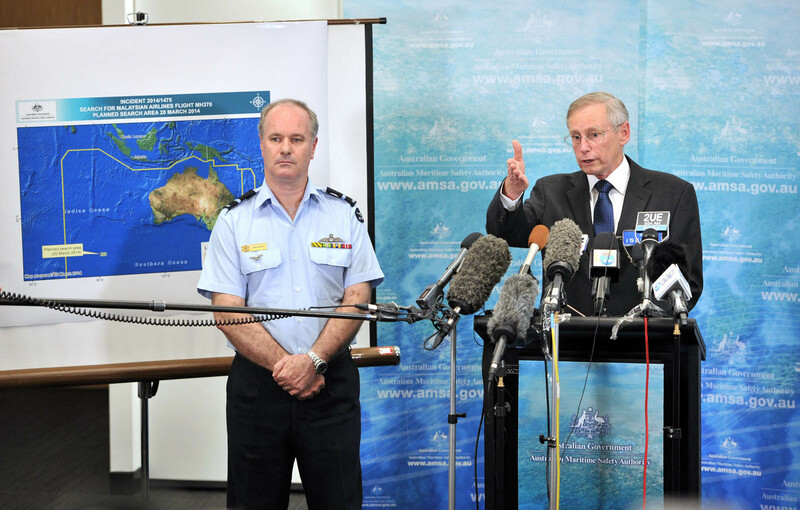 We're not expecting any significant weather," Bureau of Meteorology forecaster Luke Huntington said. 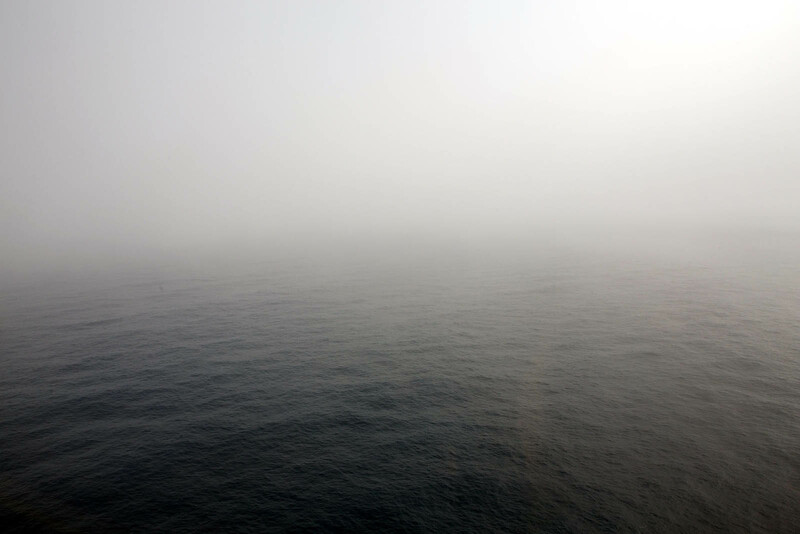 "Visibility should be greatly improved." 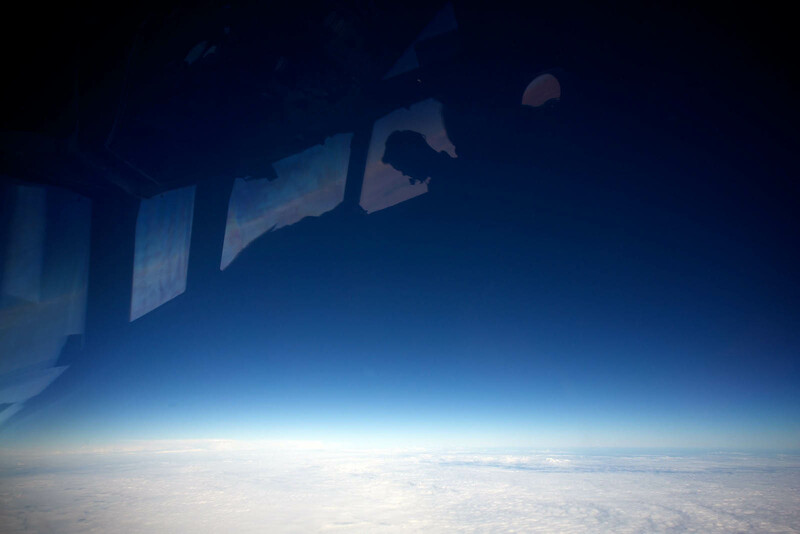 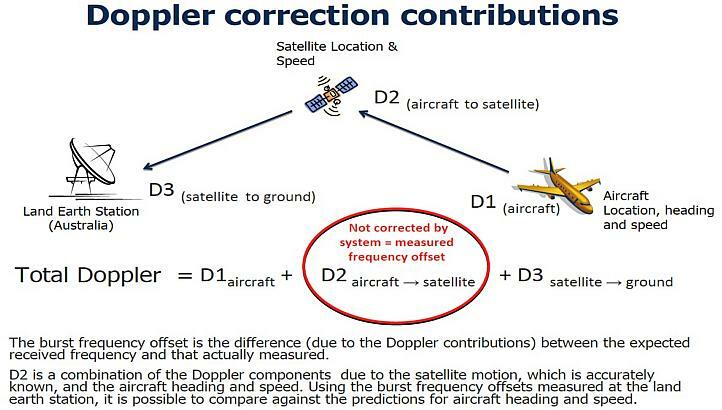 On Friday, the planes flew low under cloud cover rather than rely on radar, and the same procedure is expected to be followed Saturday. 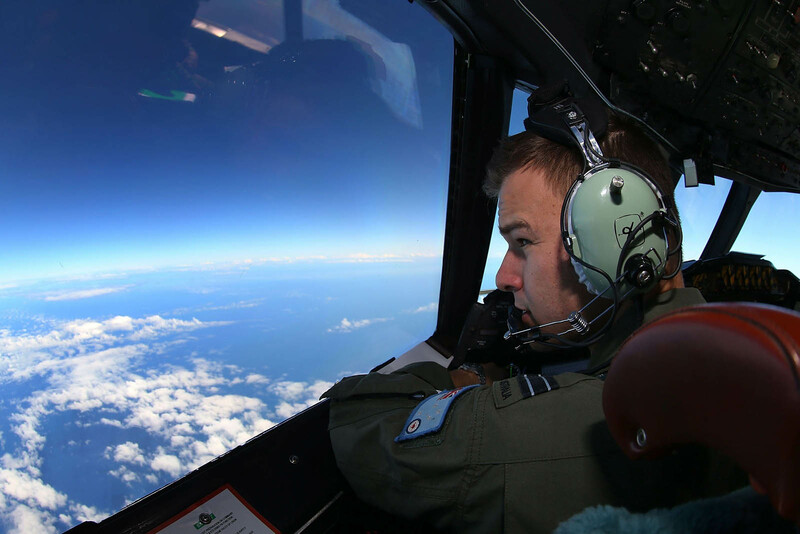 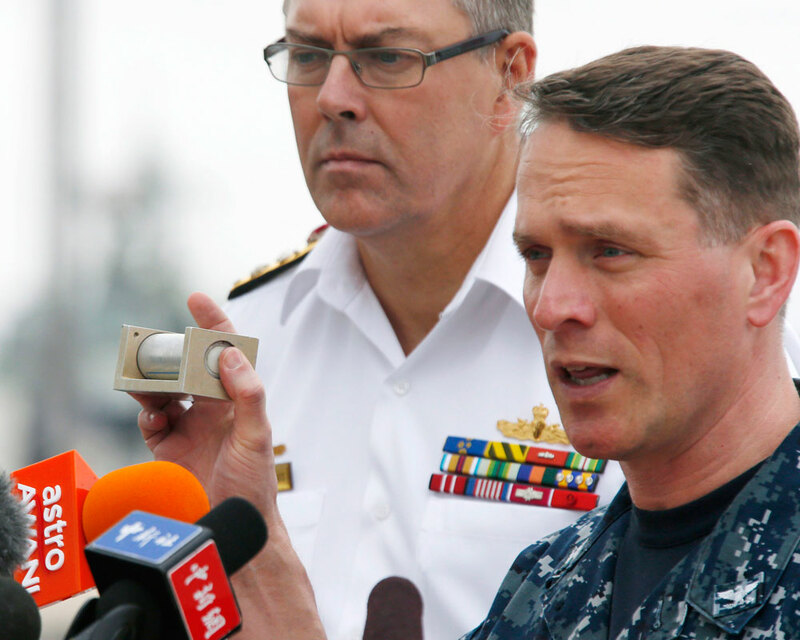 "We replanned the search to be visual, so aircraft flying relatively low, with very highly skilled observers looking out of the windows," said AMSA official John Young of Friday's search.